2 What Are We Talking About? 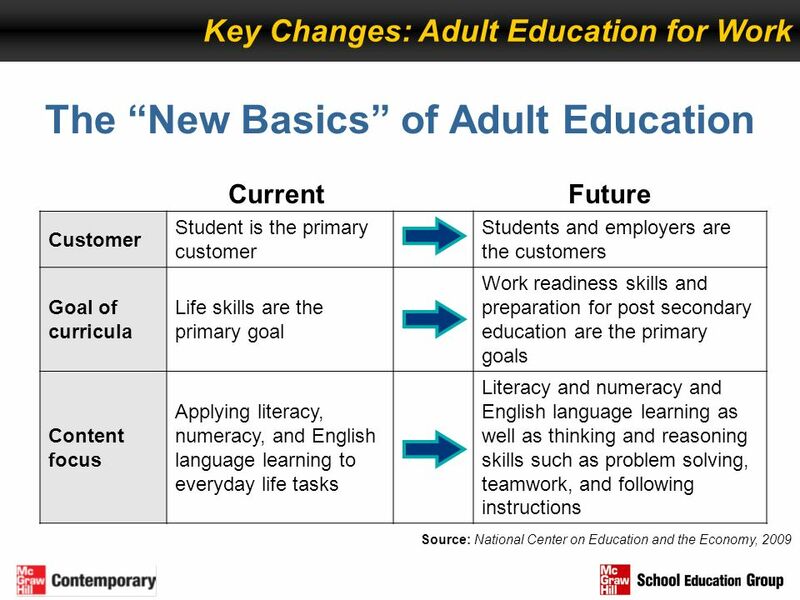 Guide to Adult Education for Work: From the National Commission on Adult Literacy, presents powerful evidence of our failure to address America’s adult education and workforce skills needs and how this is putting our country in great jeopardy and threatening our nation’s standard of living and economic viability. 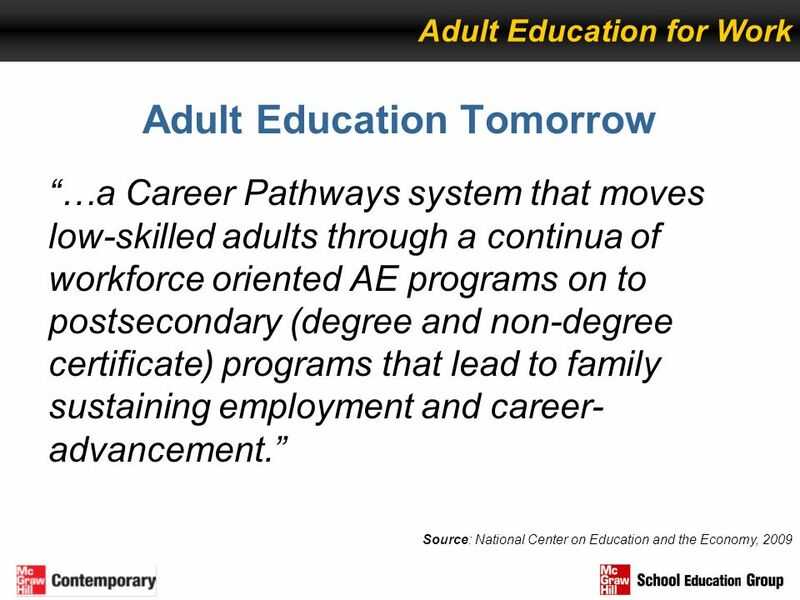 Reach Higher, America: From the One Step Forward Advisory group, National Center on Education and the Economy, in partnership with analyzes and makes recommendations for the education and training low-skilled adults need to become prepared for post-secondary or training, and for family-sustaining employment and career advancement. 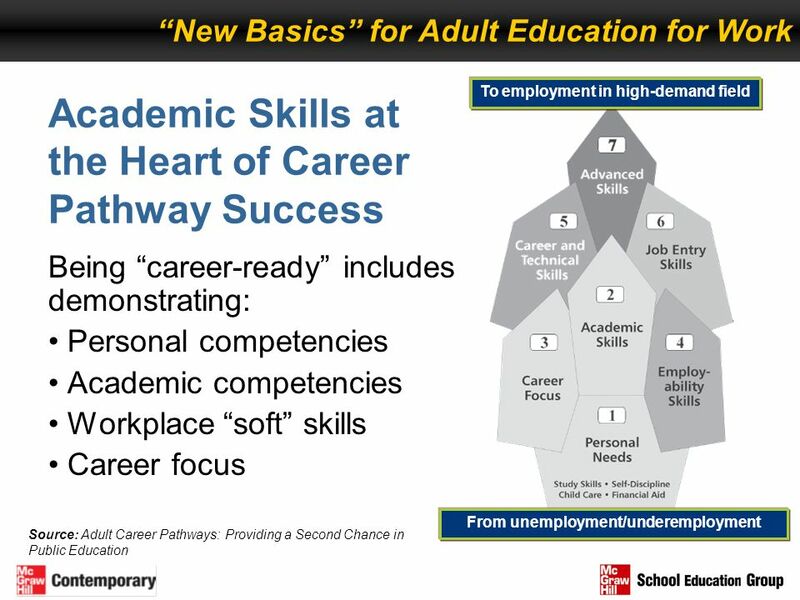 Noting the National Commission on Adult Literacy’s conclusion that the adult ed system is “ill-equipped to meet 21st Century needs,” this report focuses on the need for a transformation to an “Adult Education and workforce skills system,” part of a broader effort to build a career pathways system. Getting Ahead, Staying Ahead: A report commissioned by the Business Roundtable as part of its Springboard Project initiative, a commission of 26 of the nation’s best thinkers and doers from different sectors. 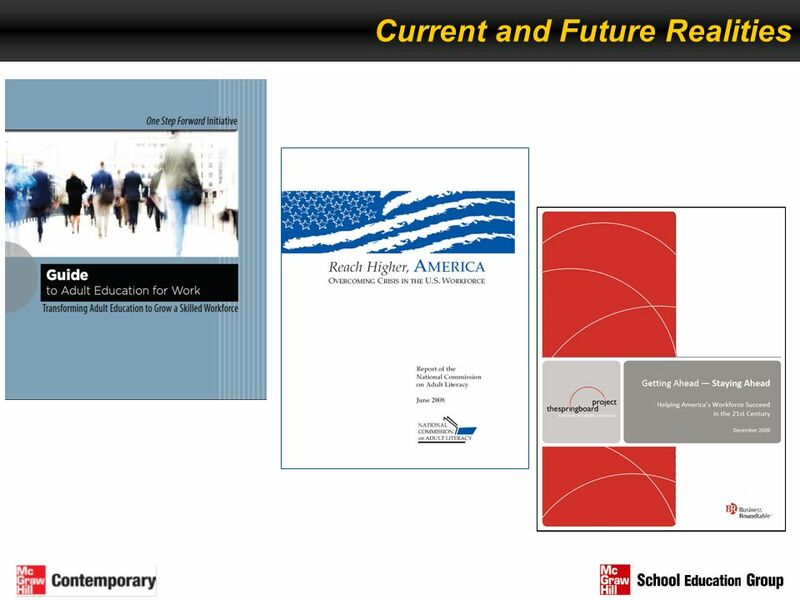 This report summarizes the commission's recommended strategies for closing the gap between workers’ current skills and those that employers need now and will need in the future. 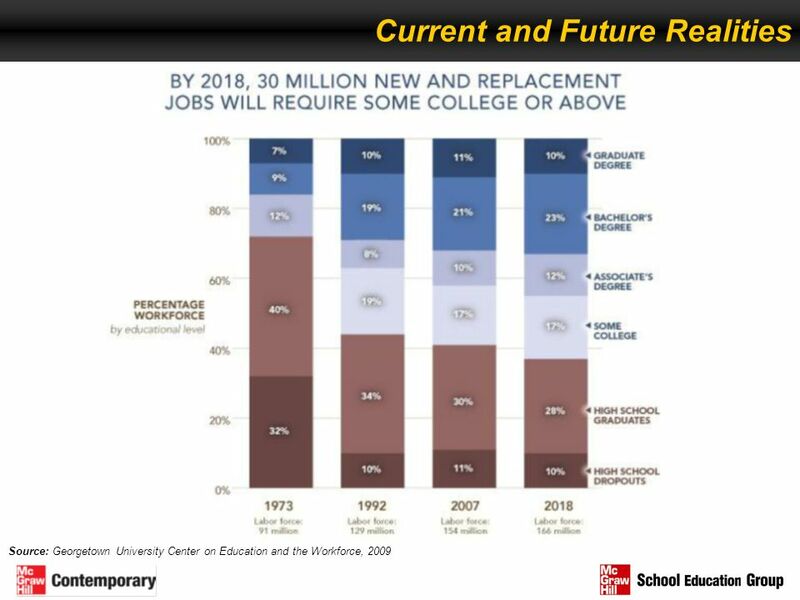 …at the same time as the skills required for careers is increasing, the United States is becoming less educated. 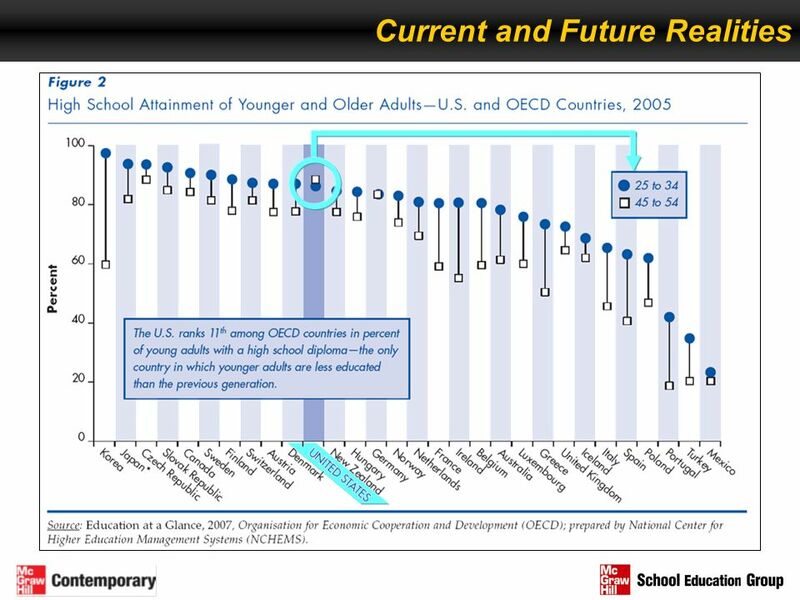 According to the Organization for Economic Cooperation and Development, the U.S. ranks 11th in percentage of adults with a high school diploma and is the ONLY OECD country where younger adults are actually less educated than the previous generation. 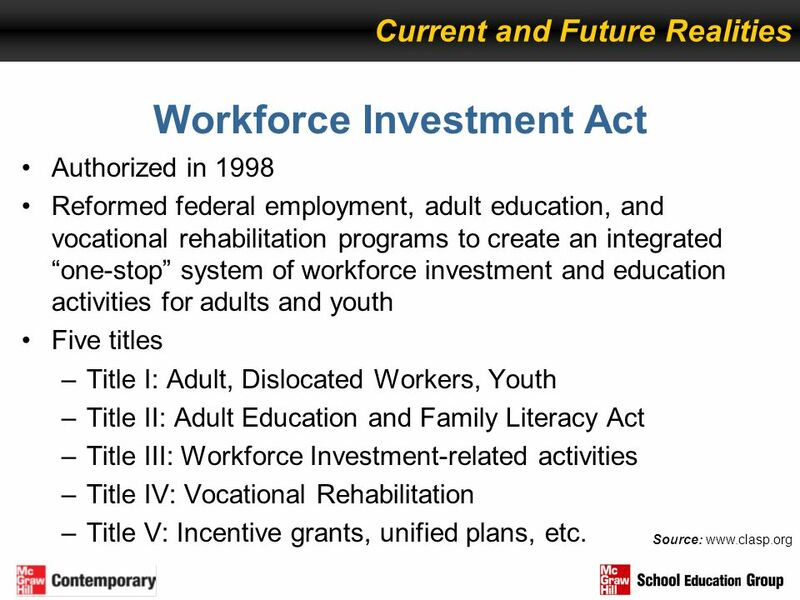 11 = WORKER SUPPLY EMPLOYER DEMAND What does this mean? For years, nobody has been counting. 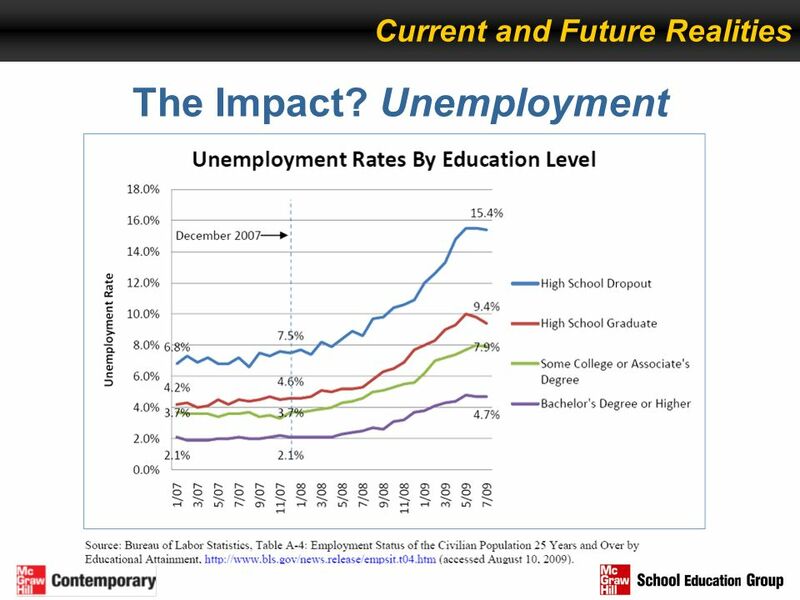 Those without high-school degrees could still often find employment. 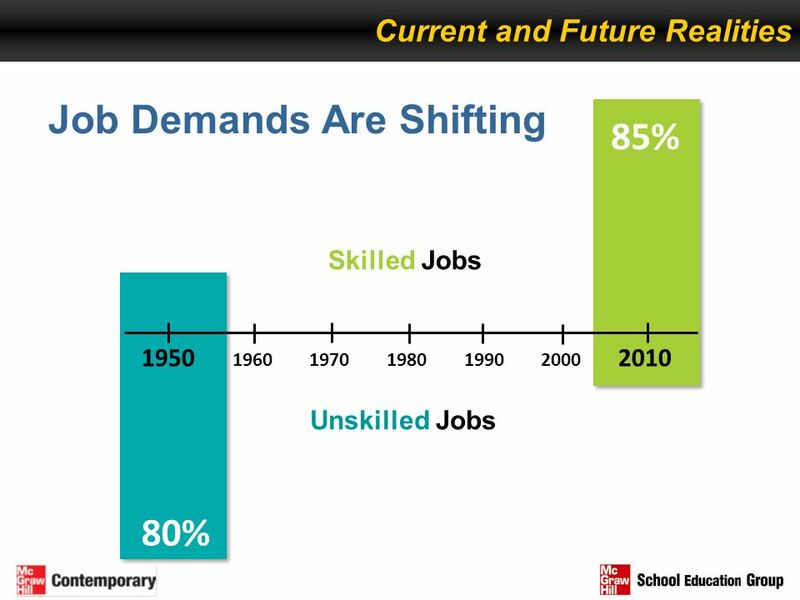 Low skill jobs still exist, however, in a knowledge-based economy, higher education is now required for entering the middle class. 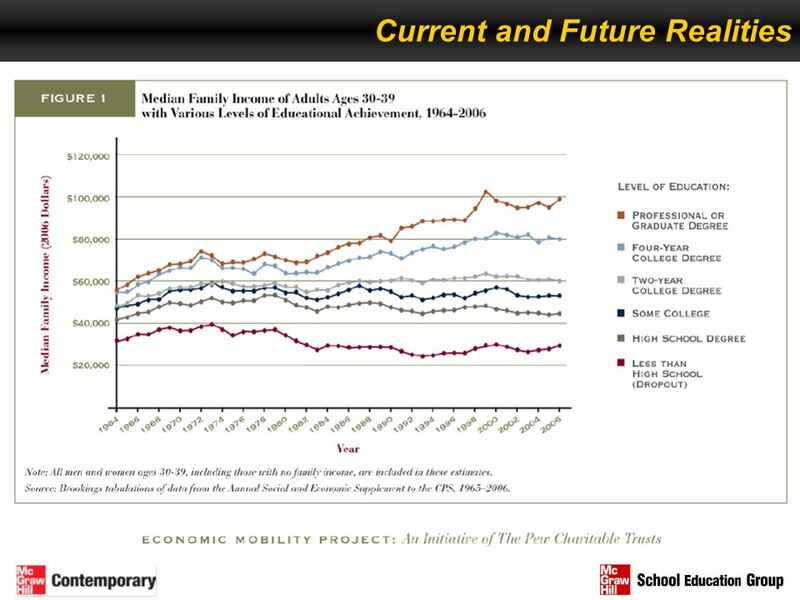 In a knowledge-based economy, there is less and less ability for those without at least some higher education to gain access to family-sustaining employment. The impacts of this paradigm are severe. 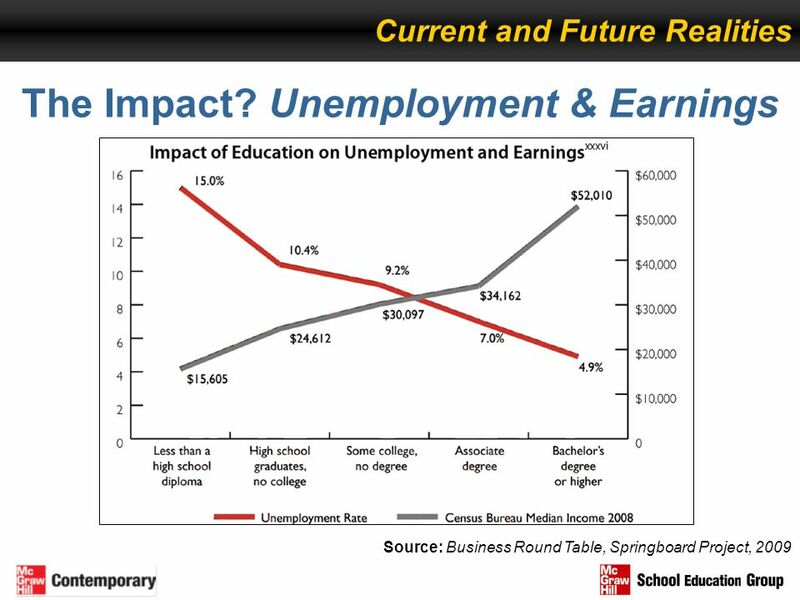 The impact of low educational attainment is not simply economic. 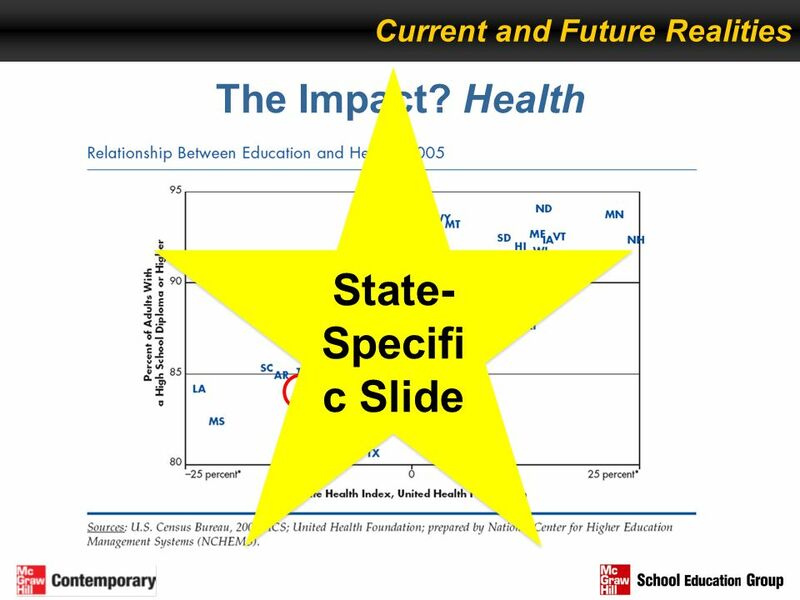 [NOTE TO PRESENTER: Move circle to the state for which this presentation is being given. 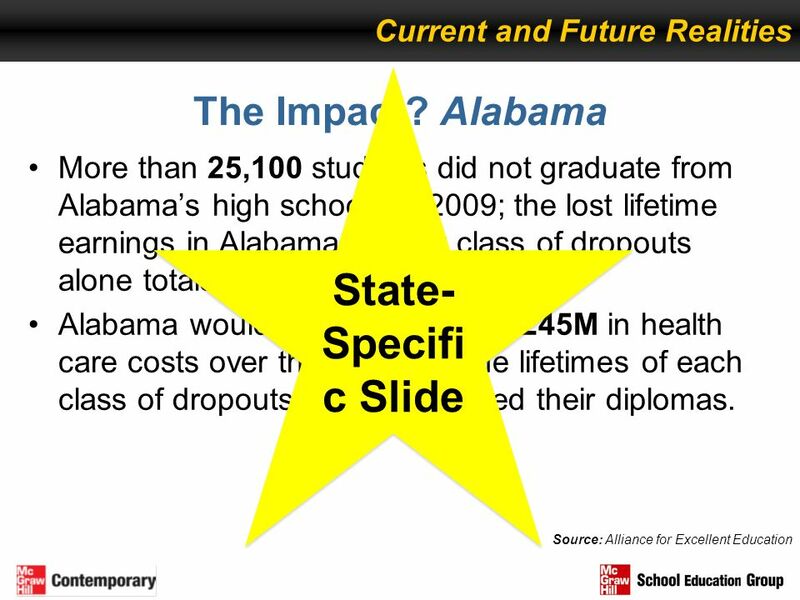 If multiple states, copy-paste the circle so that the animation occurs for each state being highlighted. 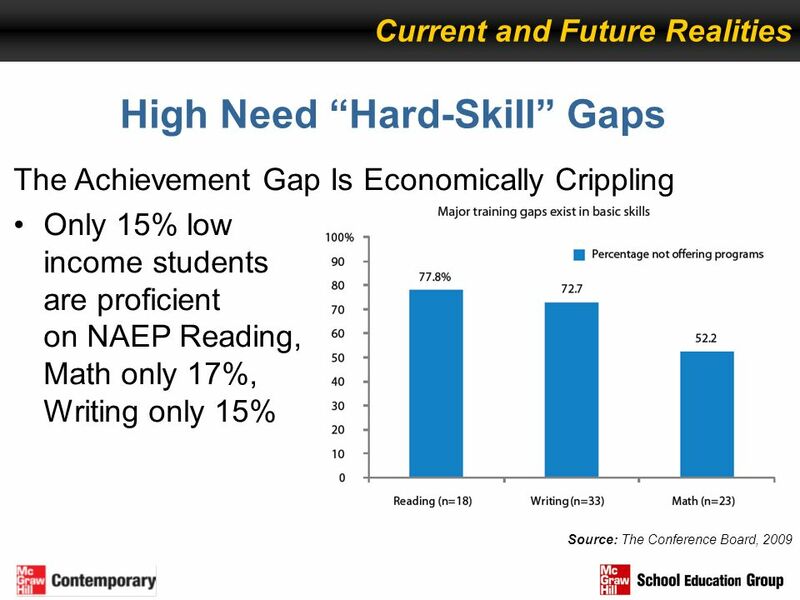 More than 93 million adults score at the lower levels of national assessments of functional literacy skills and are unprepared to enroll in postsecondary education or job training. 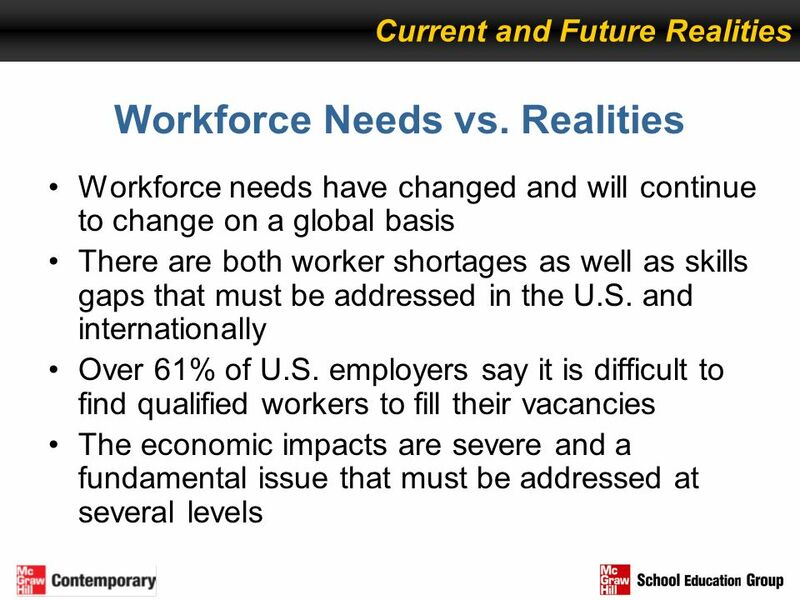 While school reform hopes to curb our nation’s workforce problem, an estimated 65% of our nation’s 2020 workforce is already beyond the reach of our educational system. 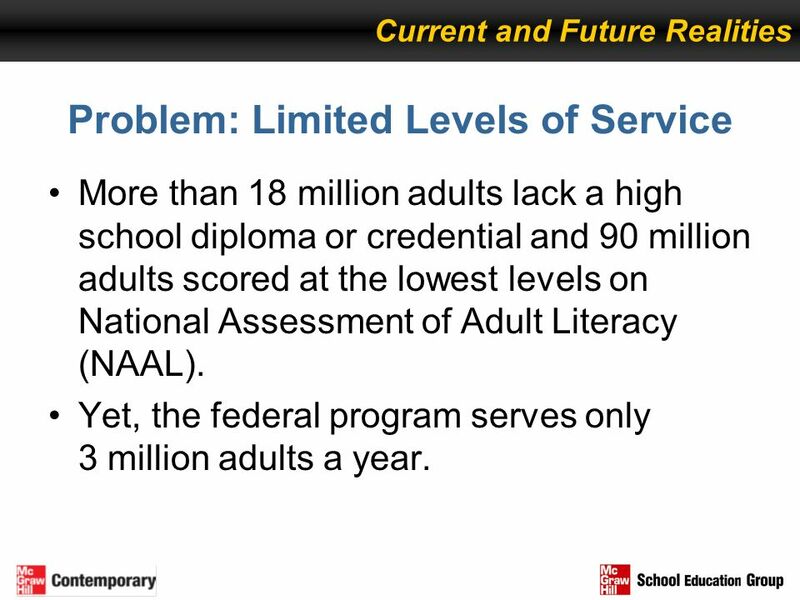 Current and Future Realities Problem: Limited Levels of Service More than 18 million adults lack a high school diploma or credential and 90 million adults scored at the lowest levels on National Assessment of Adult Literacy (NAAL). 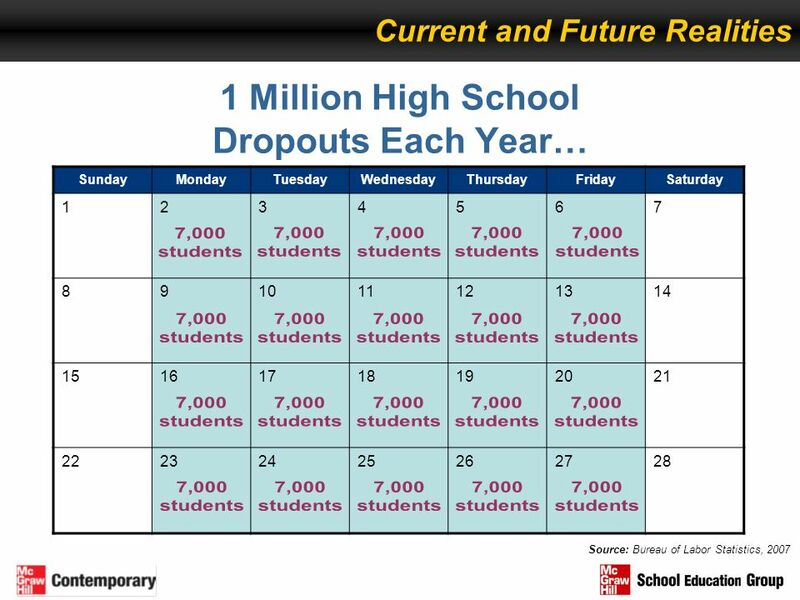 Yet, the federal program serves only 3 million adults a year. 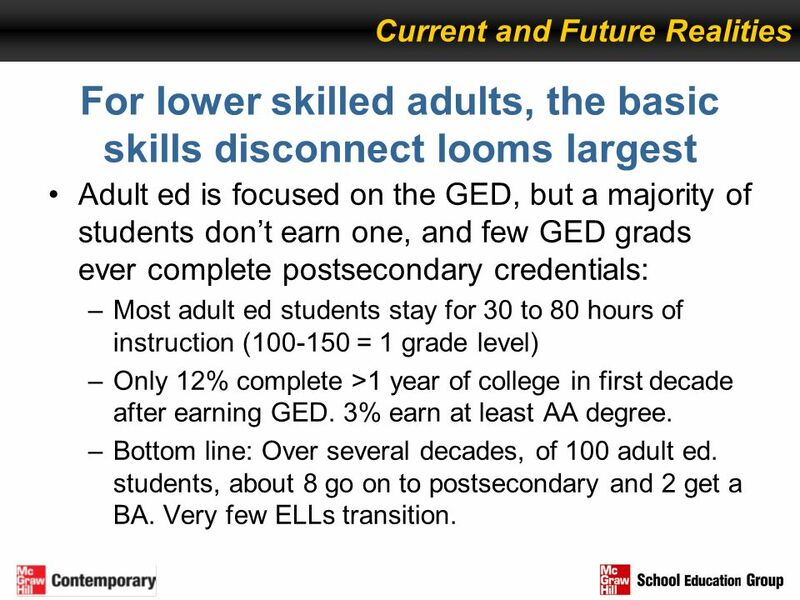 Current and Future Realities For lower skilled adults, the basic skills disconnect looms largest Adult ed is focused on the GED, but a majority of students don’t earn one, and few GED grads ever complete postsecondary credentials: Most adult ed students stay for 30 to 80 hours of instruction ( = 1 grade level) Only 12% complete >1 year of college in first decade after earning GED. 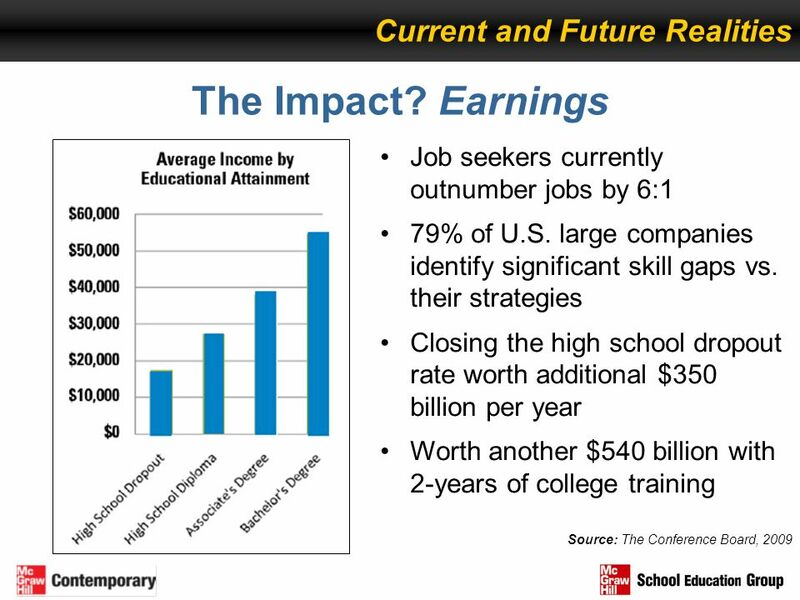 3% earn at least AA degree. 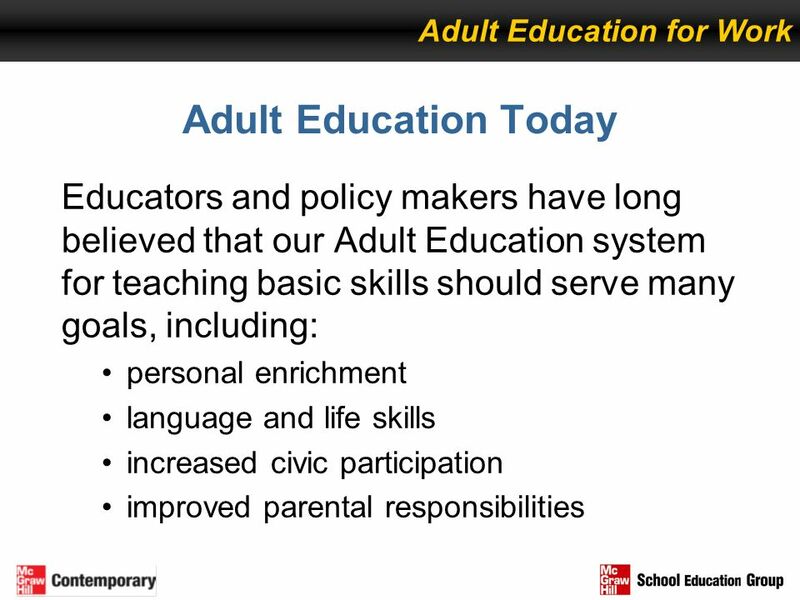 Bottom line: Over several decades, of 100 adult ed. 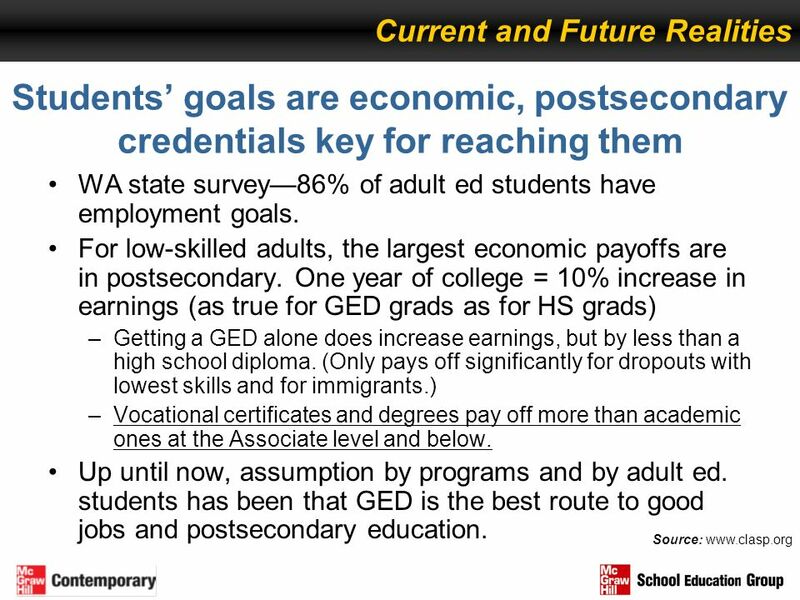 students, about 8 go on to postsecondary and 2 get a BA. 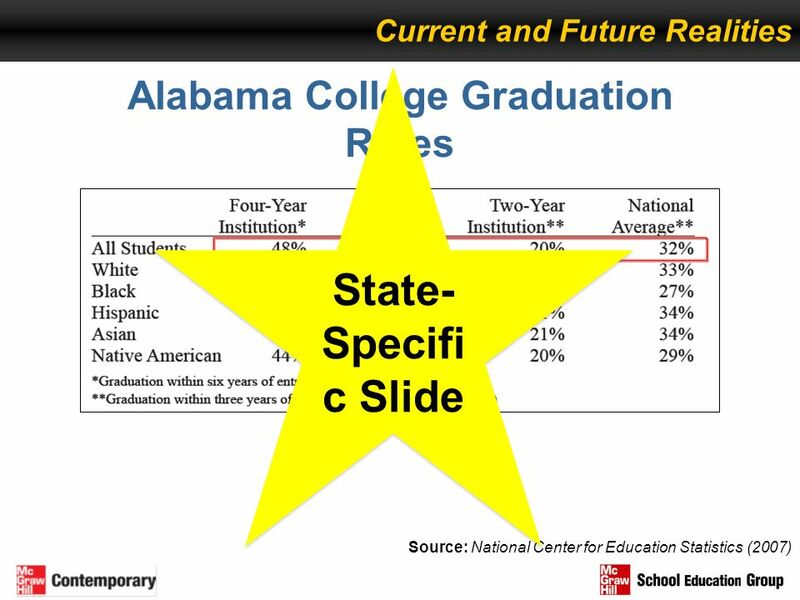 Very few ELLs transition. 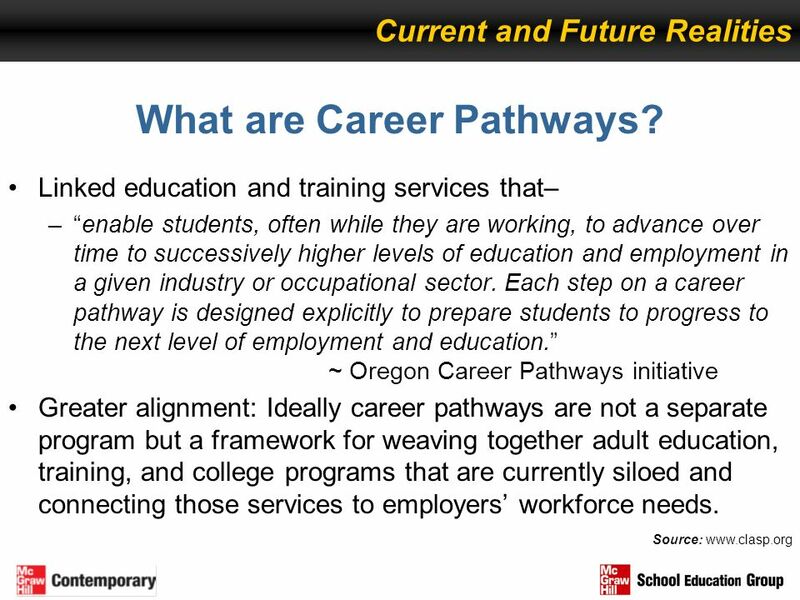 43 What are Career Pathways? 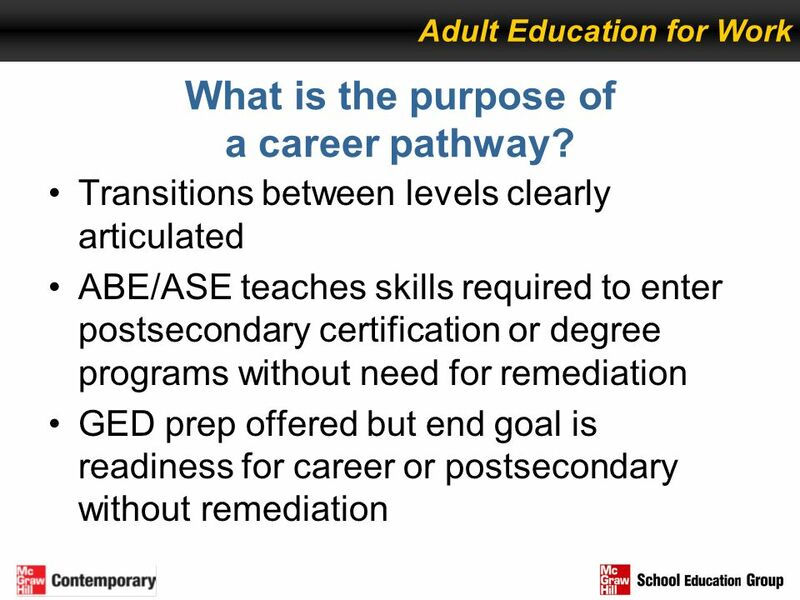 51 What is the purpose of a career pathway? 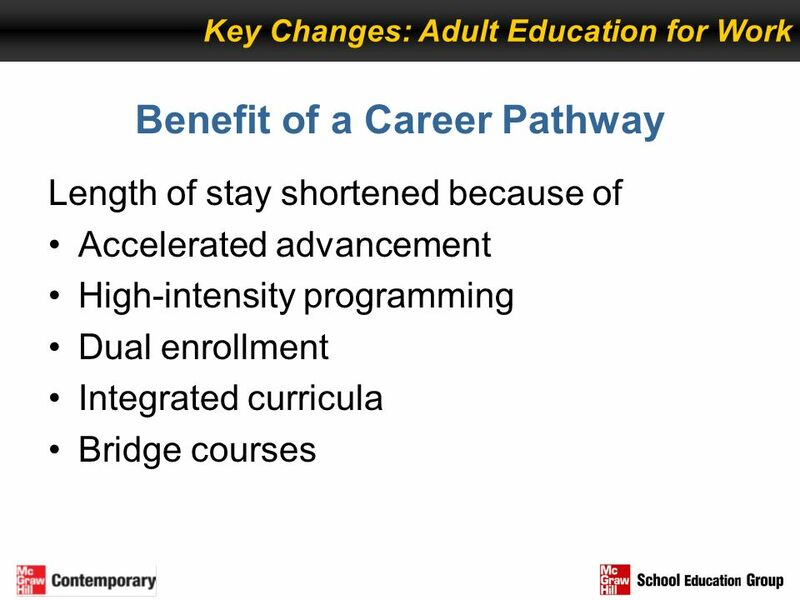 53 What are career pathway bridge programs? 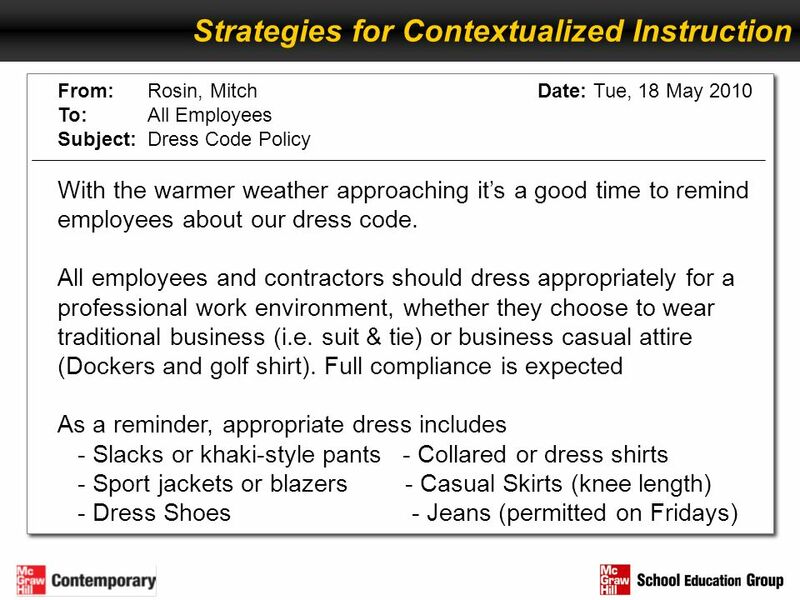 How work readiness is taught Might include some employment-related tasks like filling out a job application Teaches basic skills in a work context and stresses good work habits such as punctuality, diligence, communication, and appropriate dress and behavior Program focus Driven by students’ personal goals, needs, and interests Driven by students’ employment goals, the skill needs of family-sustaining jobs and the entry requirements for postsecondary education and training End goal Most Adult Education students never achieve a GED, much less a postsecondary education that is the key to success in today’s economy. 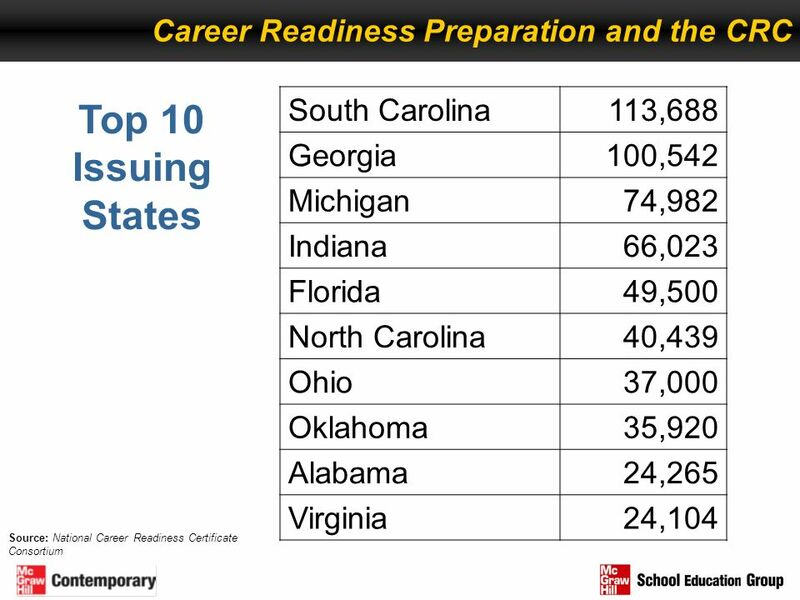 Most students achieve a high level of basic and workforce readiness skills and are prepared to enter postsecondary education and training and family-sustaining jobs. 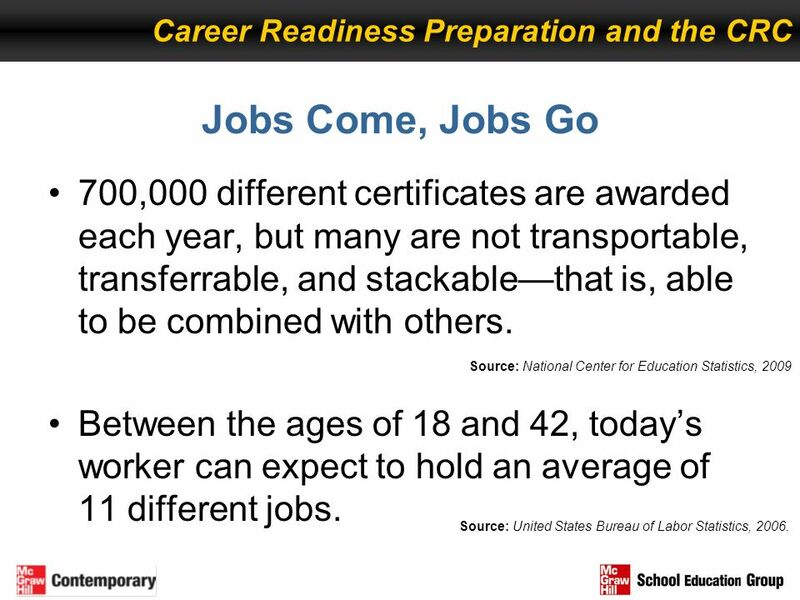 Jobs Come, Jobs Go 700,000 different certificates are awarded each year, but many are not transportable, transferrable, and stackable—that is, able to be combined with others. 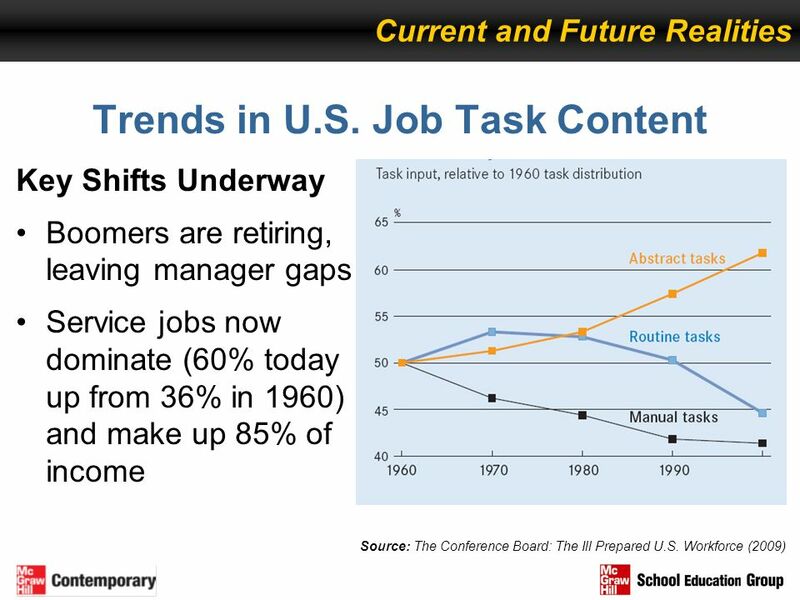 Between the ages of 18 and 42, today’s worker can expect to hold an average of 11 different jobs. 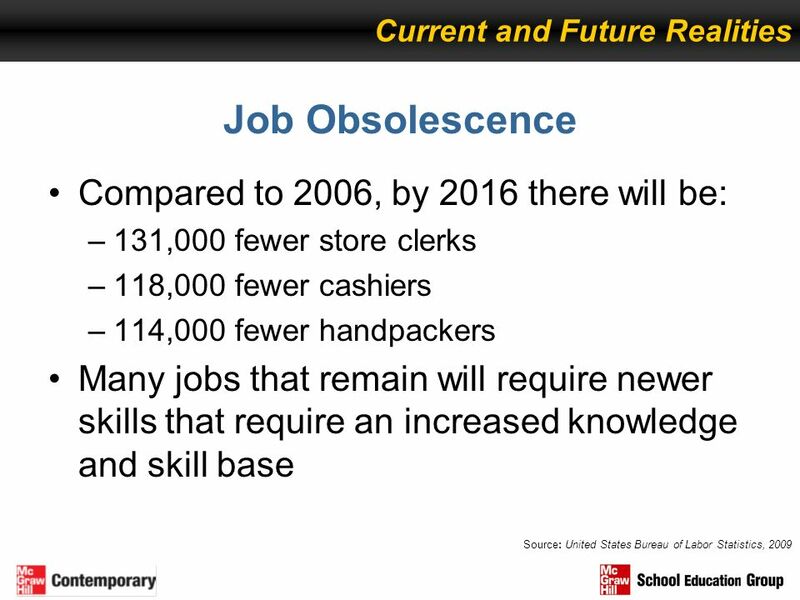 Source: National Center for Education Statistics, 2009 In 2009 alone, more than 56 million people were hired, and 59 million people left their jobs. 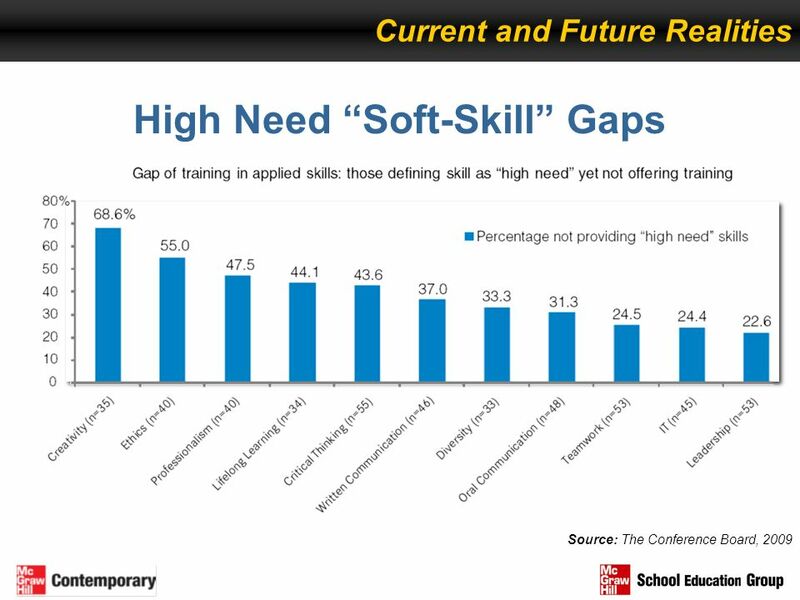 Even though workers seek training, 41% are unsure as to whether that training will actually pay off. 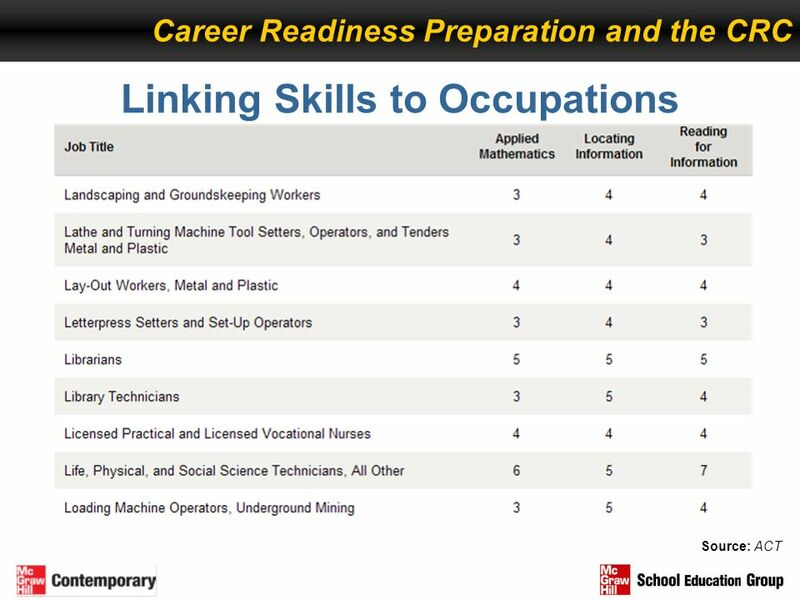 The changes in skill requirements for jobs, combined with the shrinking longevity of jobs within career paths, has created a need for employers to focus specifically on worker skills. 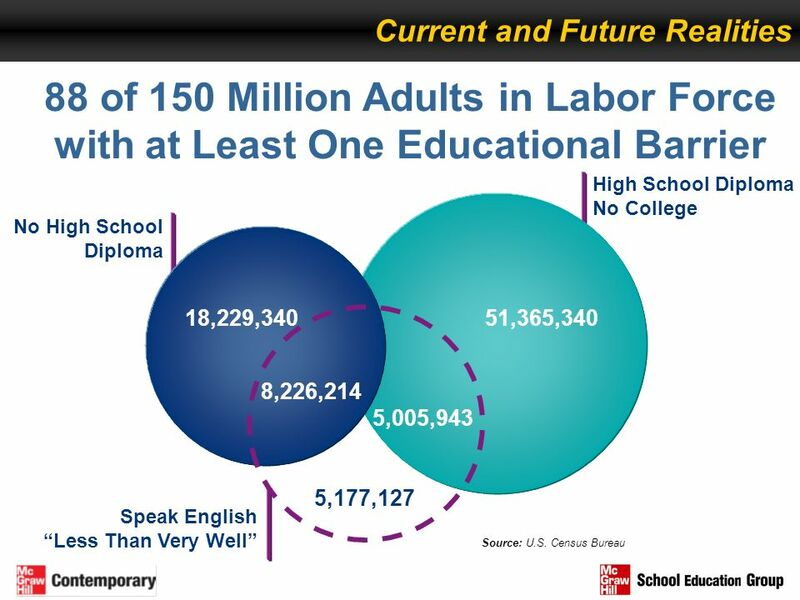 Source: United States Bureau of Labor Statistics, 2006. 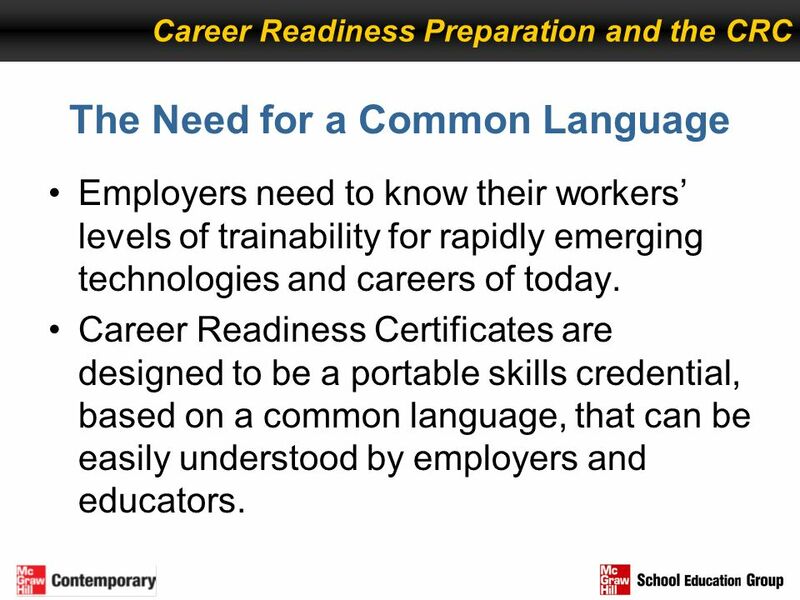 Career Readiness Preparation and the CRC The Need for a Common Language Employers need to know their workers’ levels of trainability for rapidly emerging technologies and careers of today. 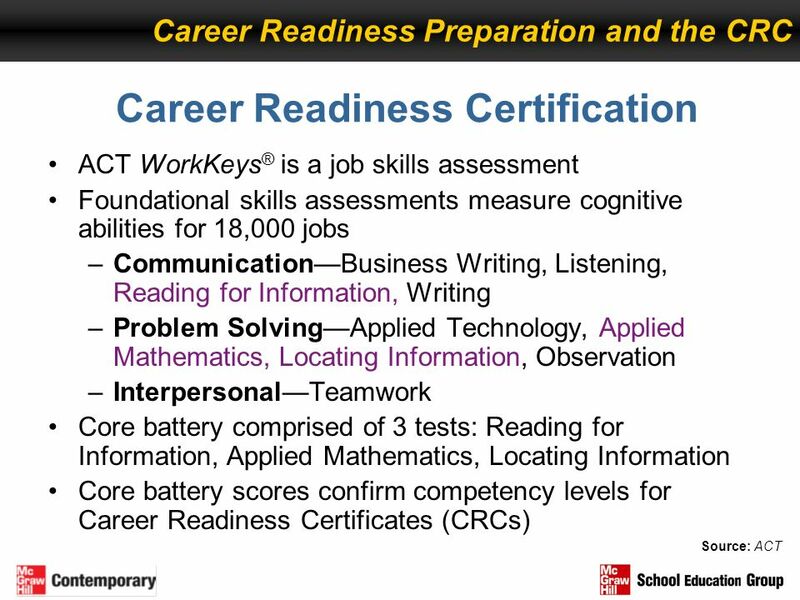 Career Readiness Certificates are designed to be a portable skills credential, based on a common language, that can be easily understood by employers and educators. 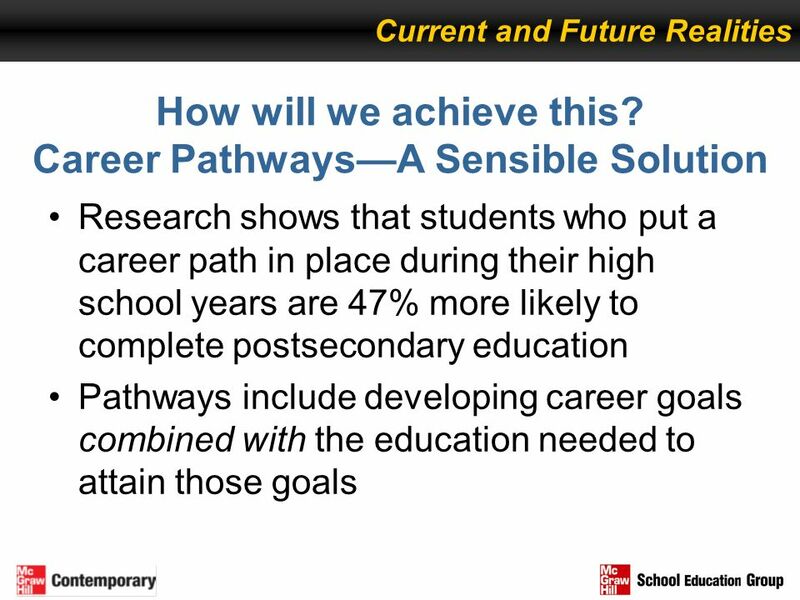 Career Readiness Preparation and the CRC Clear Pathways, Benchmarks, and Goals Click: Reveals all slide text and images. 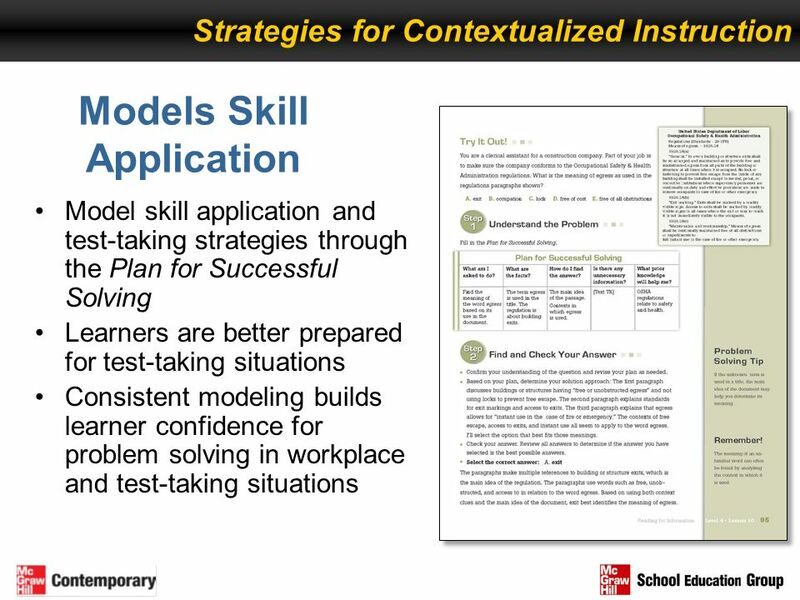 The Department of Labor’s Education and Training Administration (ETA) has developed a framework for competency models that many industries are now using to show the building blocks of skills and associated certifications needed in order to be “work-ready” within that industry. 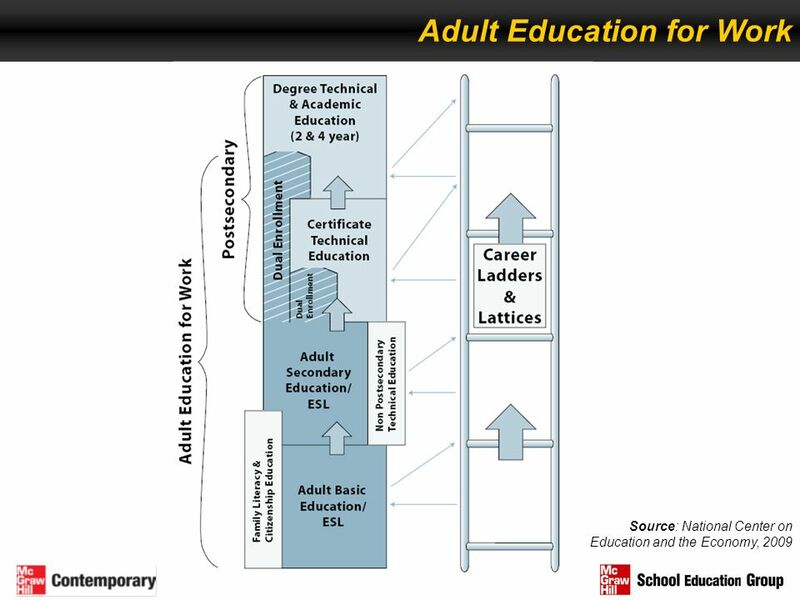 The competency model shown on the slide, developed by The Manufacturing Institute for the National Association of Manufacturing, shows the certifications needed within manufacturing on the left side and the competencies that must be evident in order to gain each certification. 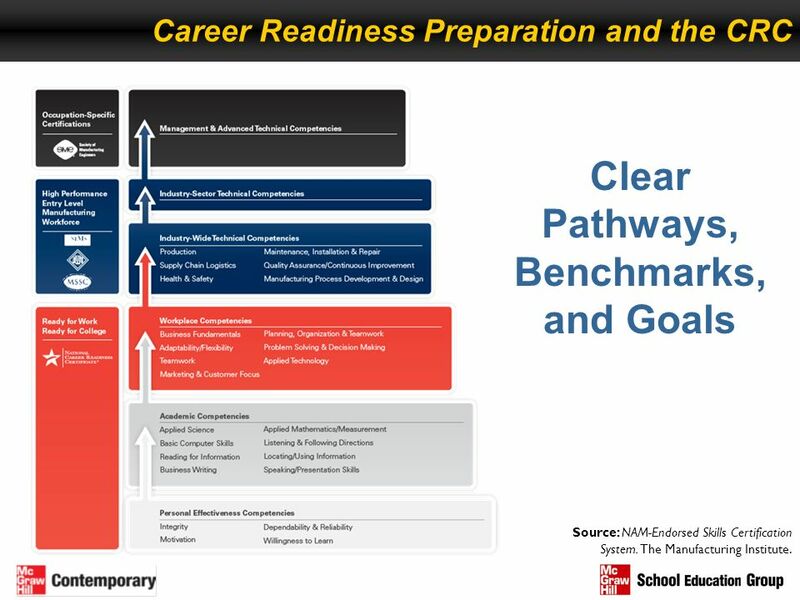 The “blocks” from the bottom up to red (Personal Effectiveness, Academic, and Workplace Competencies) comprise the skills that are needed in order to be what NAM considers “work-ready.” The aligned certification is the National Career Readiness Certificate. 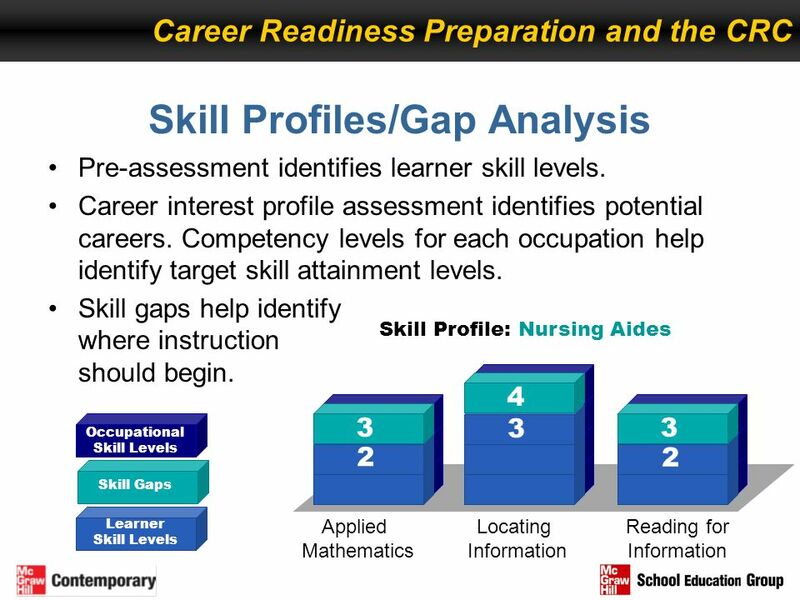 Source: NAM-Endorsed Skills Certification System. The Manufacturing Institute. 69 TEACH TO THE TASK! So, do I teach to the test? 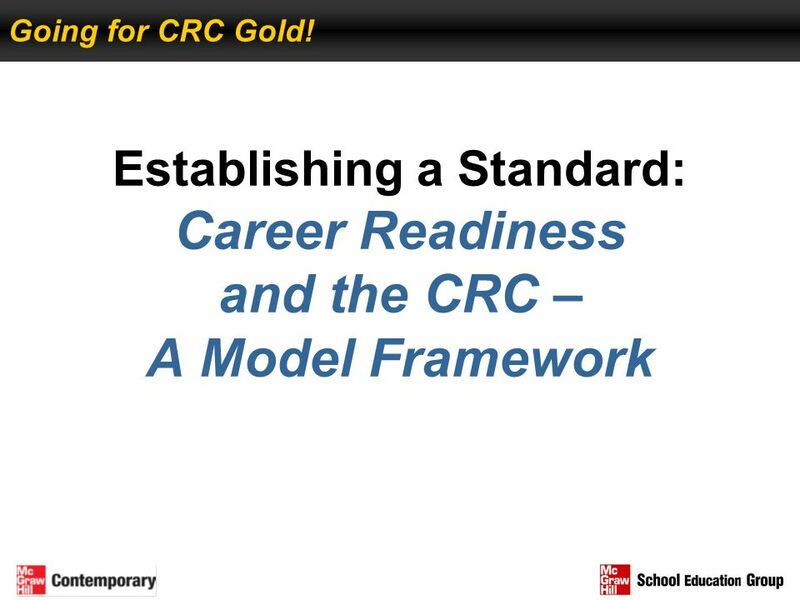 Career Readiness Preparation and the CRC So, do I teach to the test? 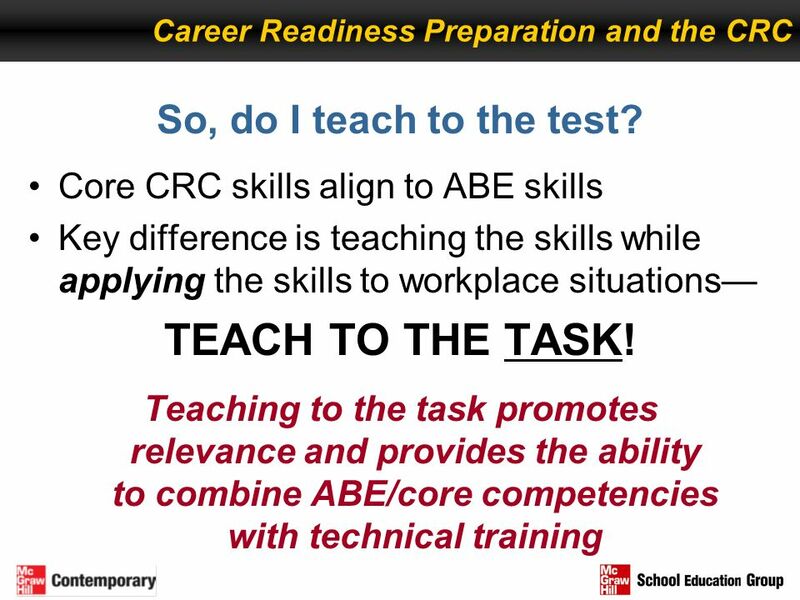 Core CRC skills align to ABE skills Key difference is teaching the skills while applying the skills to workplace situations— TEACH TO THE TASK! 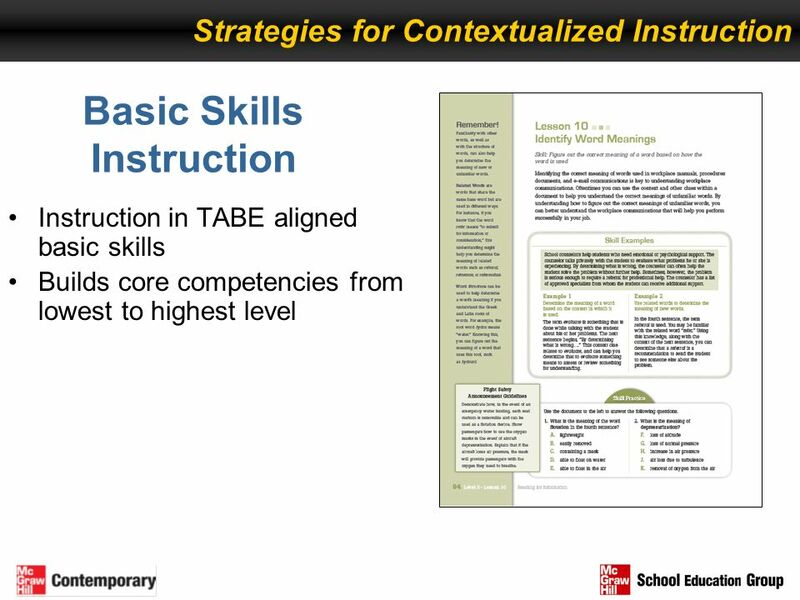 Teaching to the task promotes relevance and provides the ability to combine ABE/core competencies with technical training Clicks: Each click reveals a new bullet. 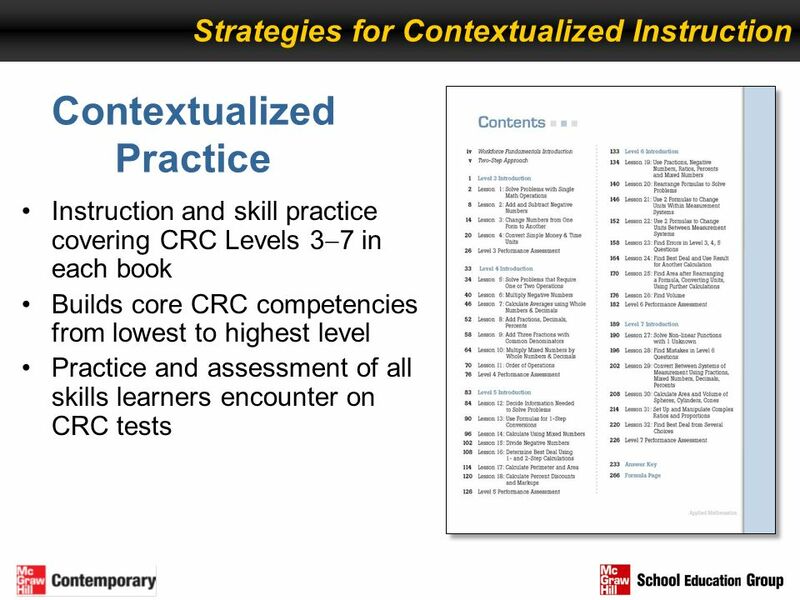 Since CRC skills align strongly to TABE, you can easily cover TABE skills through applied, contextualized instruction of CRC skills. 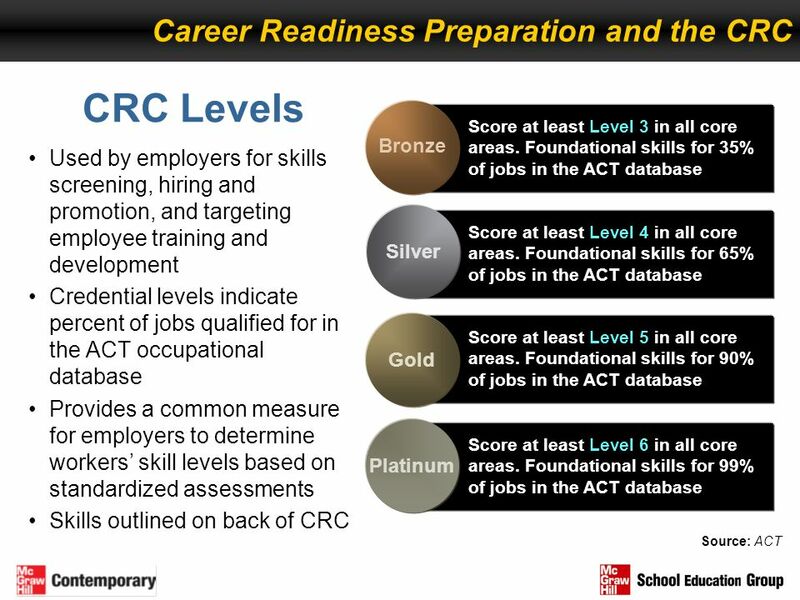 Regardless of whether students within a program are planning to take a CRC test, teaching skills within applied workplace scenarios is sound practice for establishing relevance and developing students’ higher-level ability to apply skills. 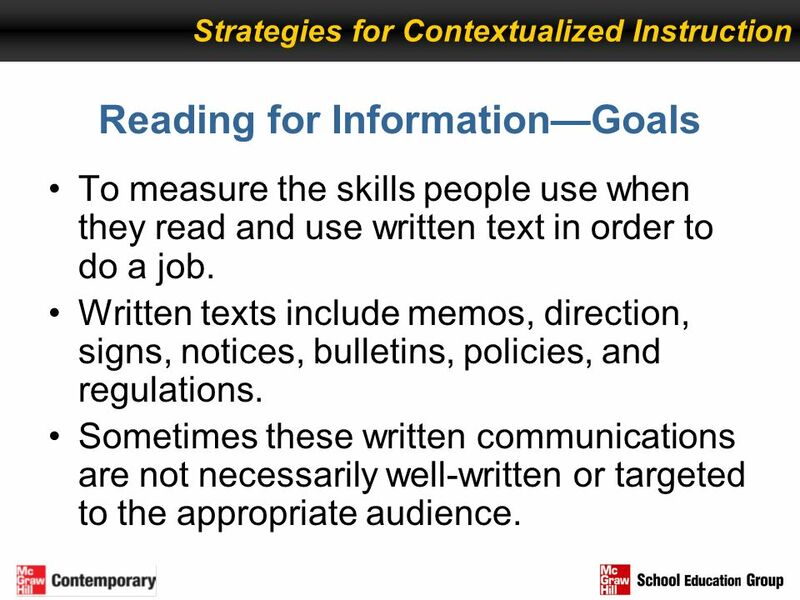 Strategies for Contextualized Instruction Reading for Information—Goals To measure the skills people use when they read and use written text in order to do a job. 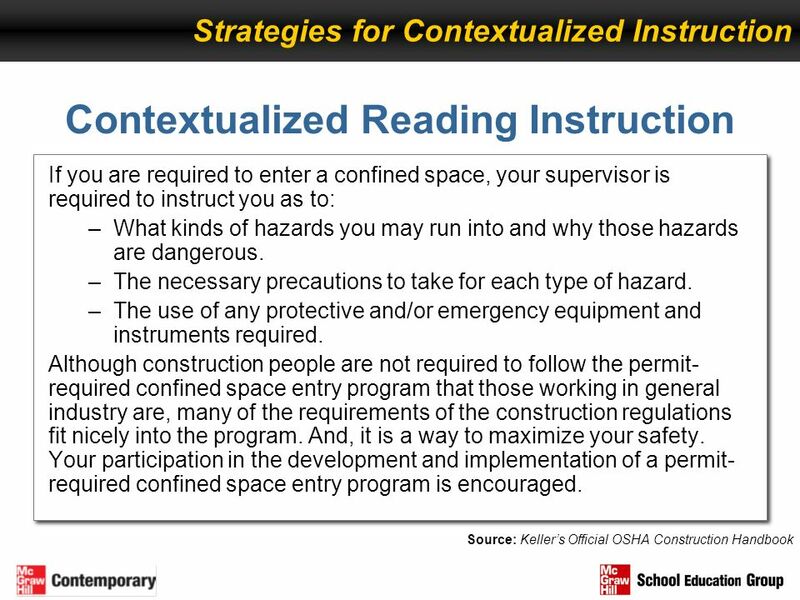 Written texts include memos, direction, signs, notices, bulletins, policies, and regulations. Sometimes these written communications are not necessarily well-written or targeted to the appropriate audience. 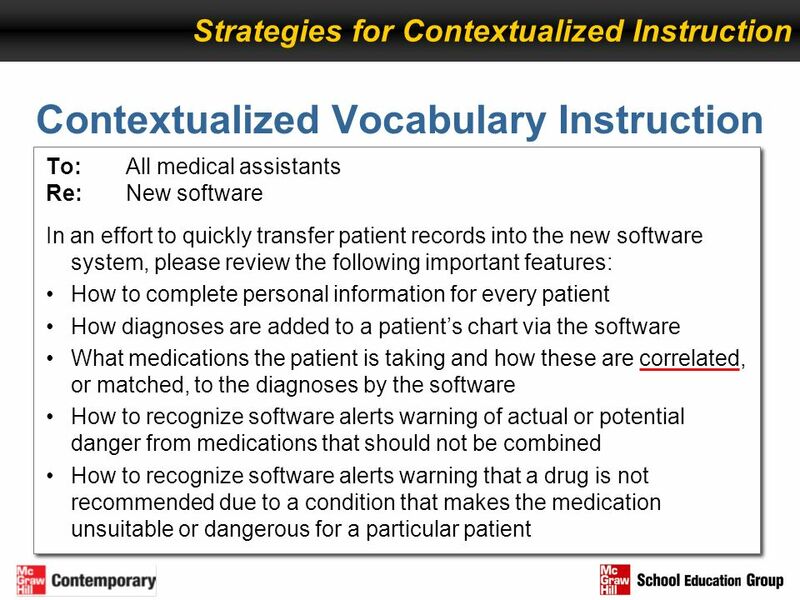 Strategies for Contextualized Instruction Contextualized Vocabulary Instruction To: All medical assistants Re: New software In an effort to quickly transfer patient records into the new software system, please review the following important features: How to complete personal information for every patient How diagnoses are added to a patient’s chart via the software What medications the patient is taking and how these are correlated, or matched, to the diagnoses by the software How to recognize software alerts warning of actual or potential danger from medications that should not be combined How to recognize software alerts warning that a drug is not recommended due to a condition that makes the medication unsuitable or dangerous for a particular patient This example uses a workplace memo. 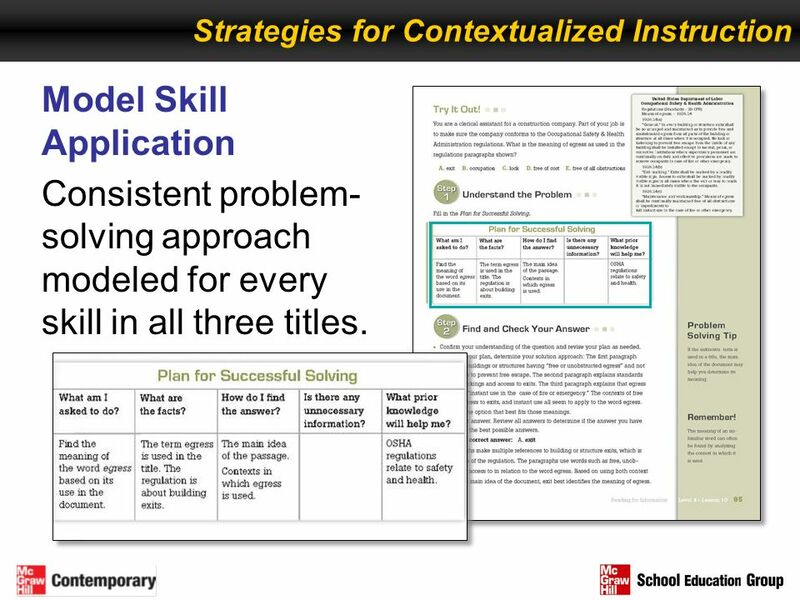 The skill being practiced here is identifying the meaning of a word that is clearly defined in the reading. 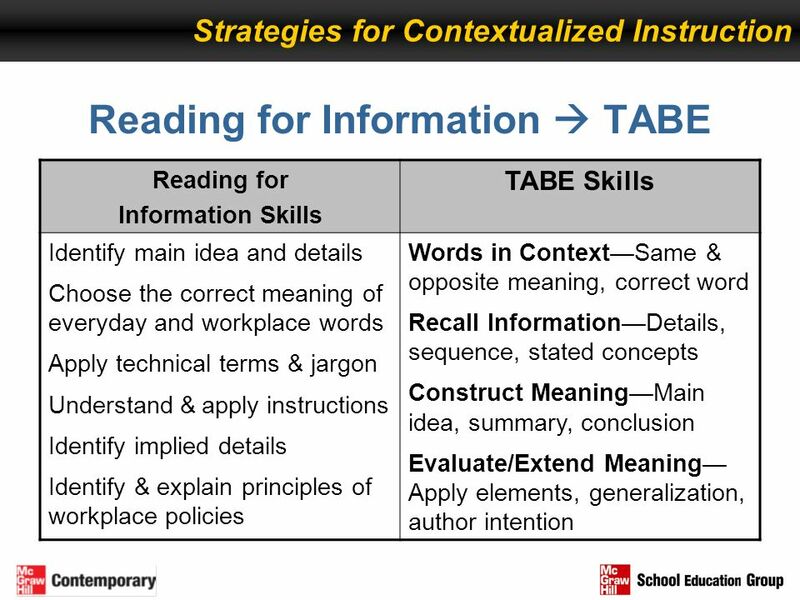 The TABE skill that this aligns to is defining words in context. CLICK: What is the meaning of the underlined word? What words in context provide the meaning of this word. (Click underlines “correlated” within the passage.) 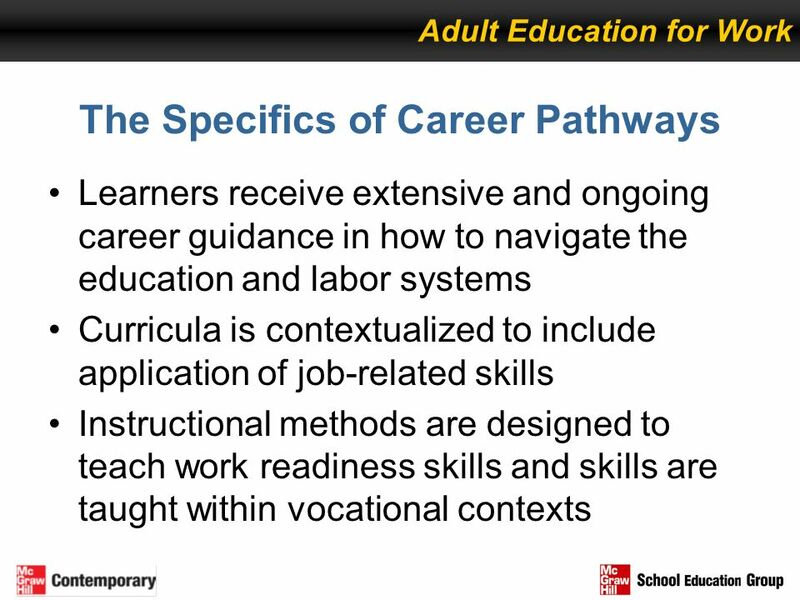 How does this contextualized passage help someone in a health science career pathway better understand the skills needed and situations that arise on the job? 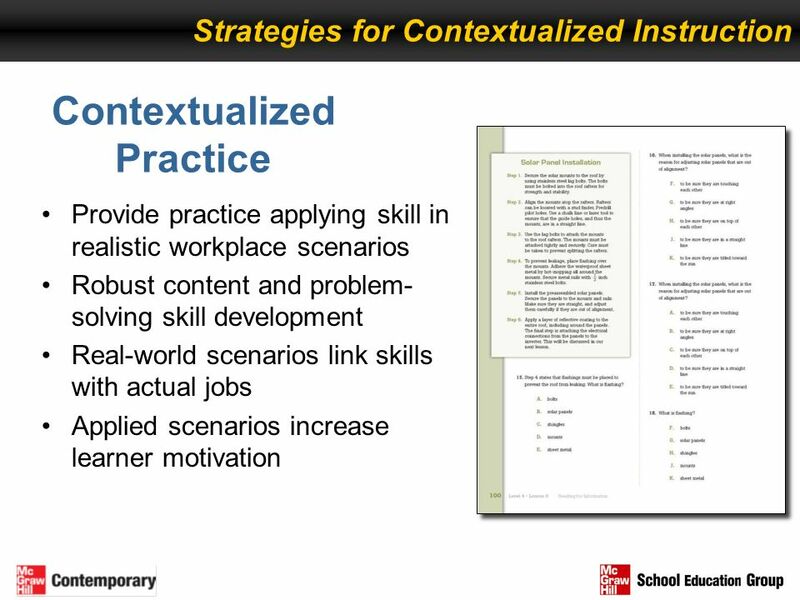 How does in create relevance for learning how to define words in context? 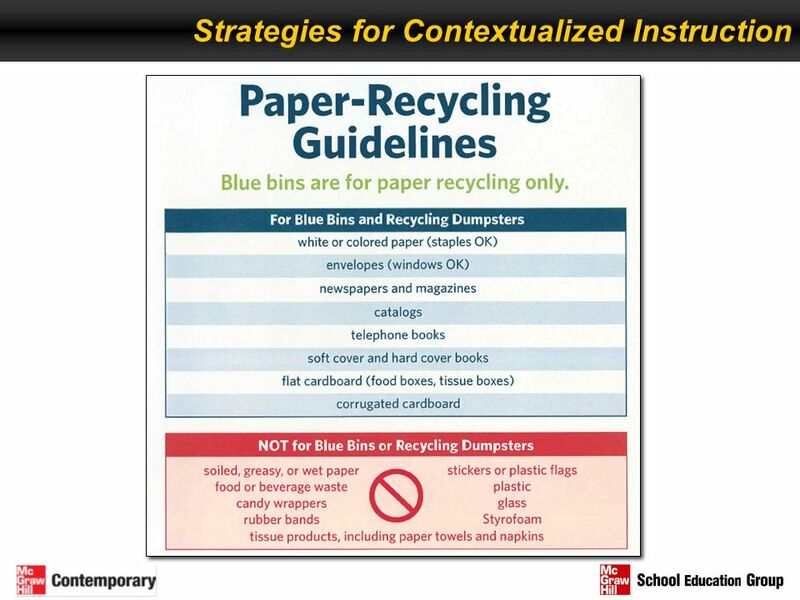 75 How do I provide this for my students? 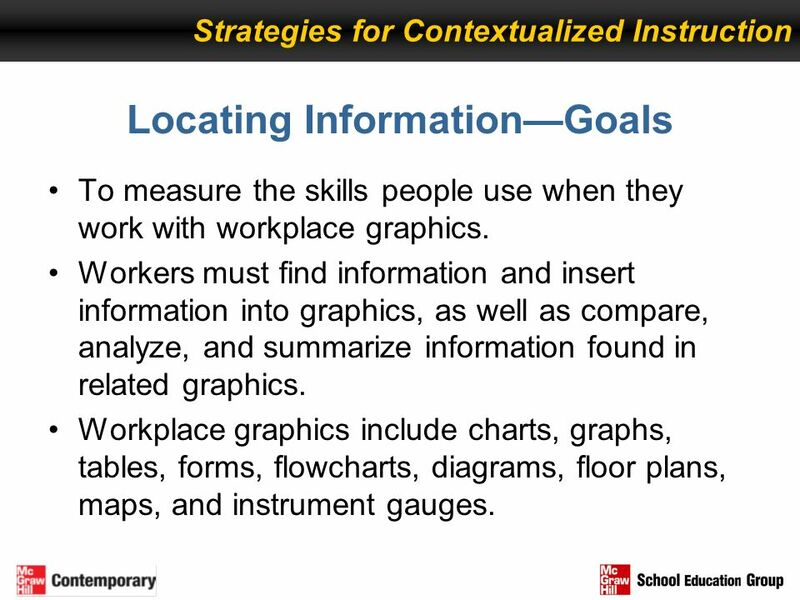 Strategies for Contextualized Instruction Locating Information—Goals To measure the skills people use when they work with workplace graphics. 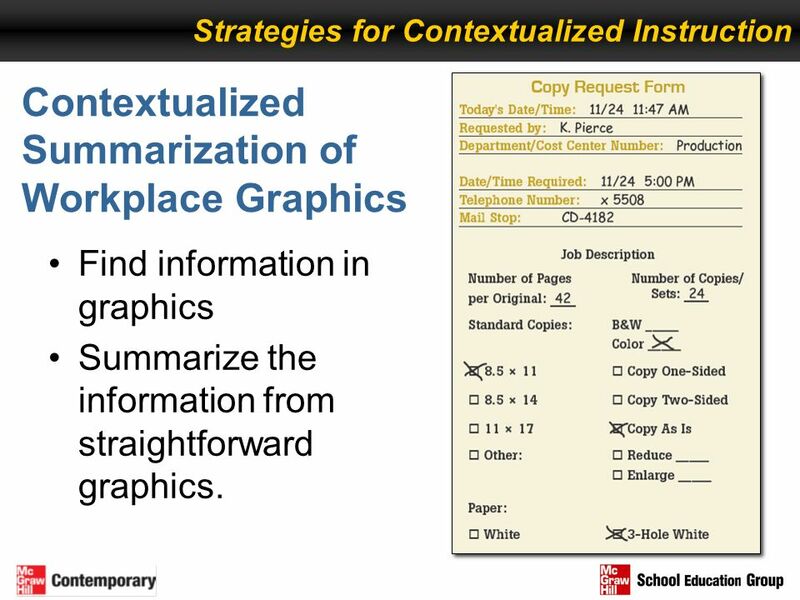 Workers must find information and insert information into graphics, as well as compare, analyze, and summarize information found in related graphics. Workplace graphics include charts, graphs, tables, forms, flowcharts, diagrams, floor plans, maps, and instrument gauges. 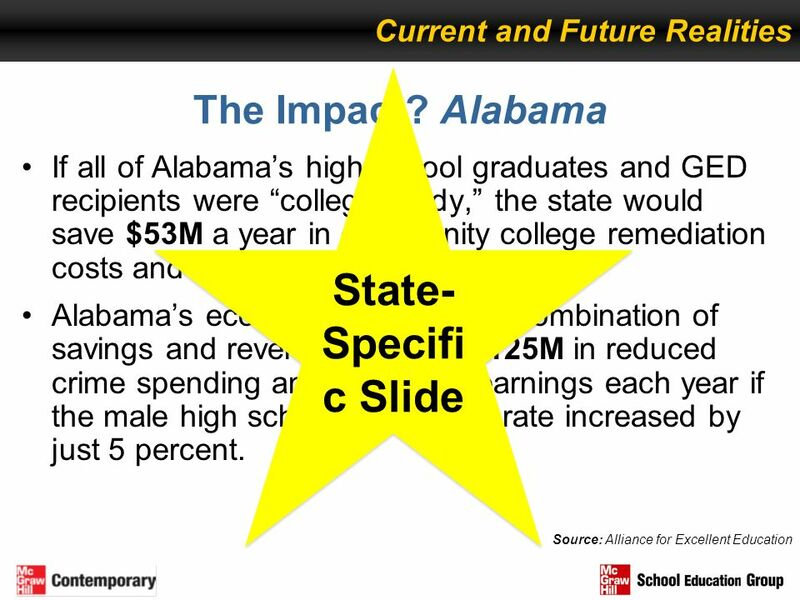 This example requires the student to use two graphics. 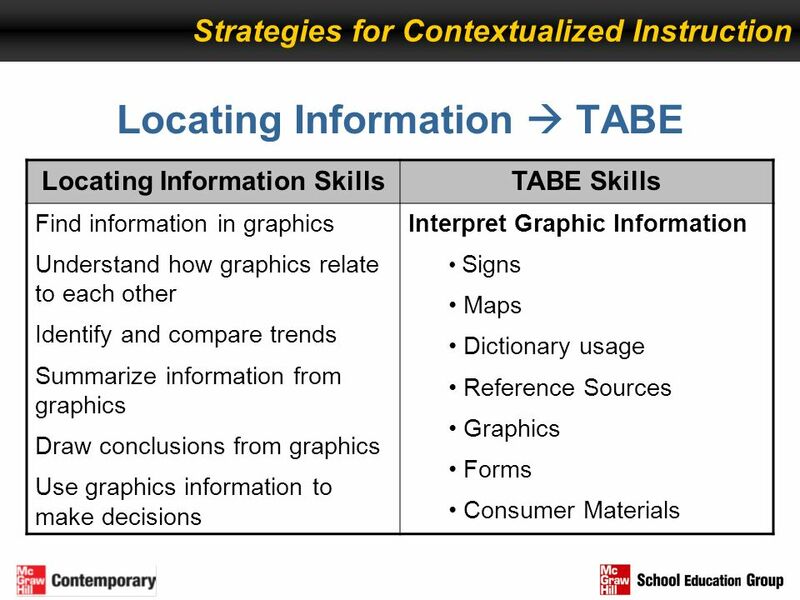 The skill being practiced are “find information from one or two graphics,” “understand how graphics relate,” and “apply information from one or more complicated graphics to specific situations.” The TABE skill is to interpret graphic information. As the manager of Lindy’s Sandwich Shop, you are creating the schedule. You have almost completed the schedule for your part-time employees, but still have the Tuesday evening shift to fill. Who is available to work the open shift on Tuesday? 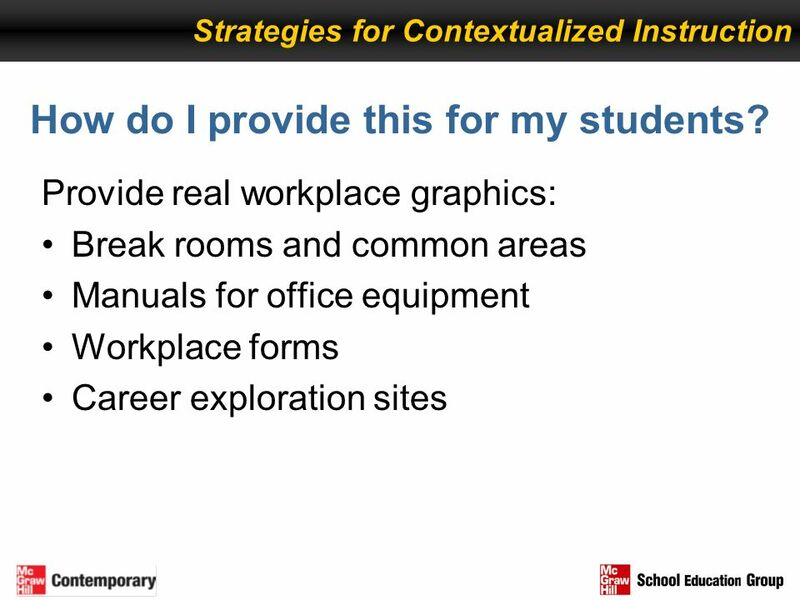 82 How do I provide this for my students? 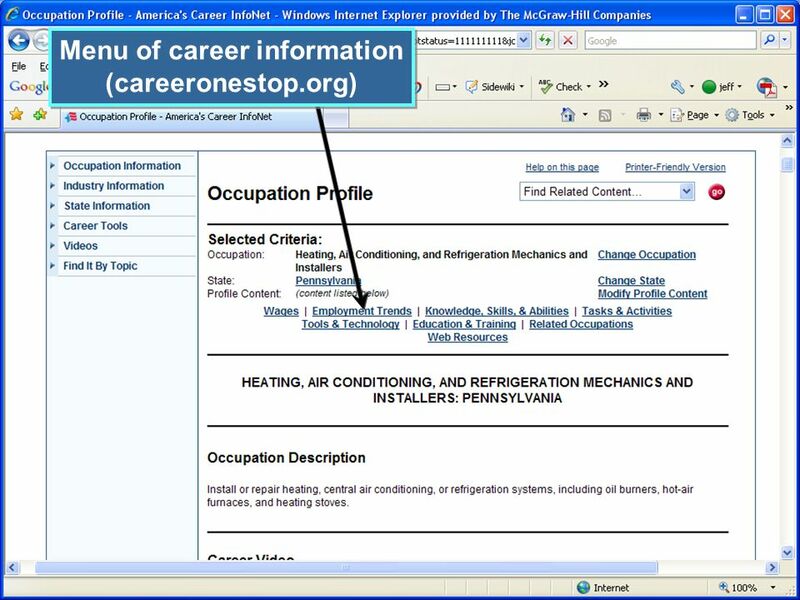 84 Students learn that by selecting the navigation link, they are brought to the portion of the page that includes that information. 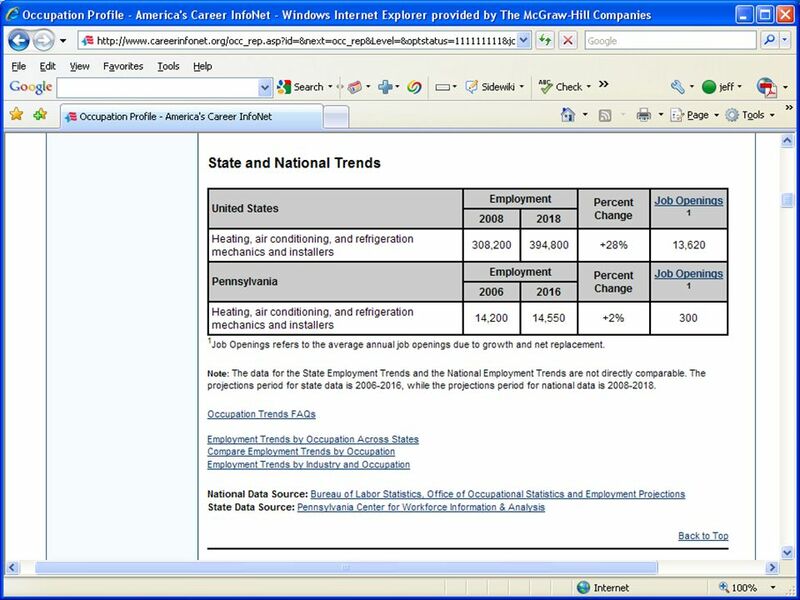 Using data statistics from occupational profiles, such as employment and wage trends, students can practice locating and comparing information from charts, lists, and other graphics. 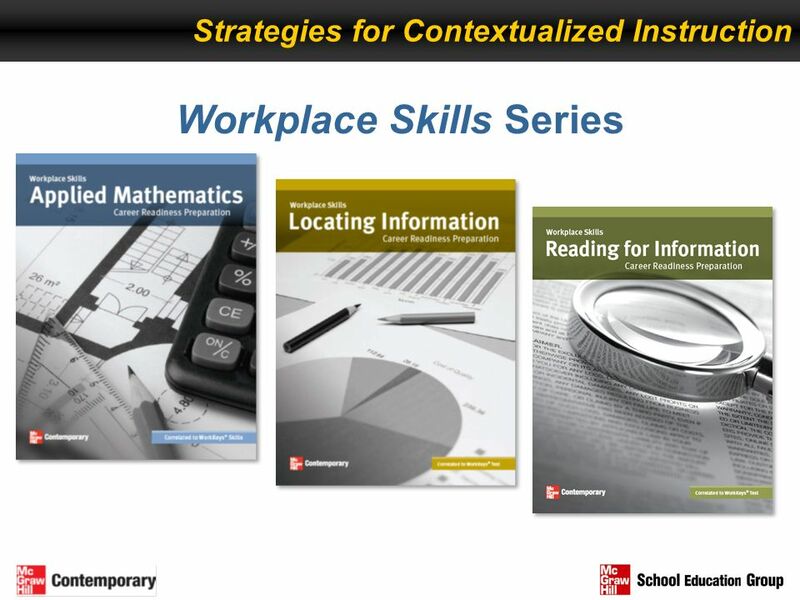 Strategies for Contextualized Instruction Applied Mathematics—Goals Measure the skills people use when they apply mathematical reasoning, critical thinking, and problem-solving techniques to work-related problems. 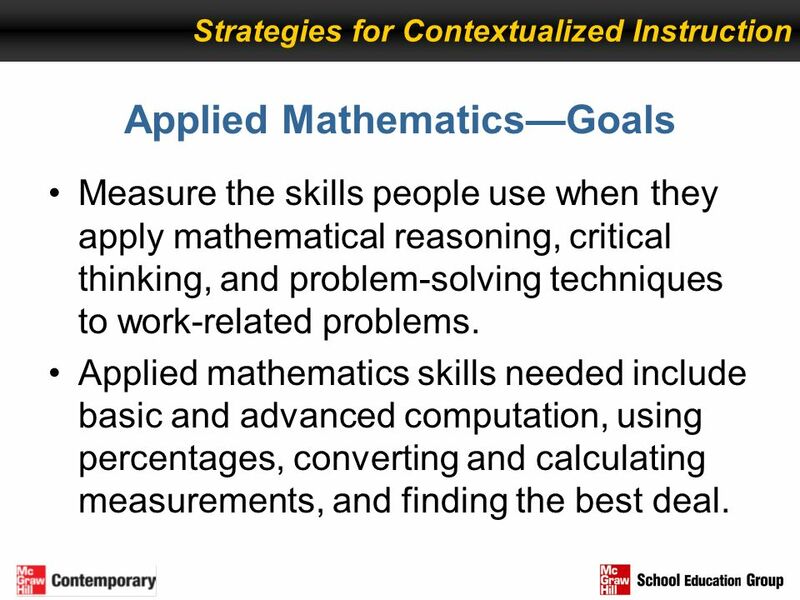 Applied mathematics skills needed include basic and advanced computation, using percentages, converting and calculating measurements, and finding the best deal. 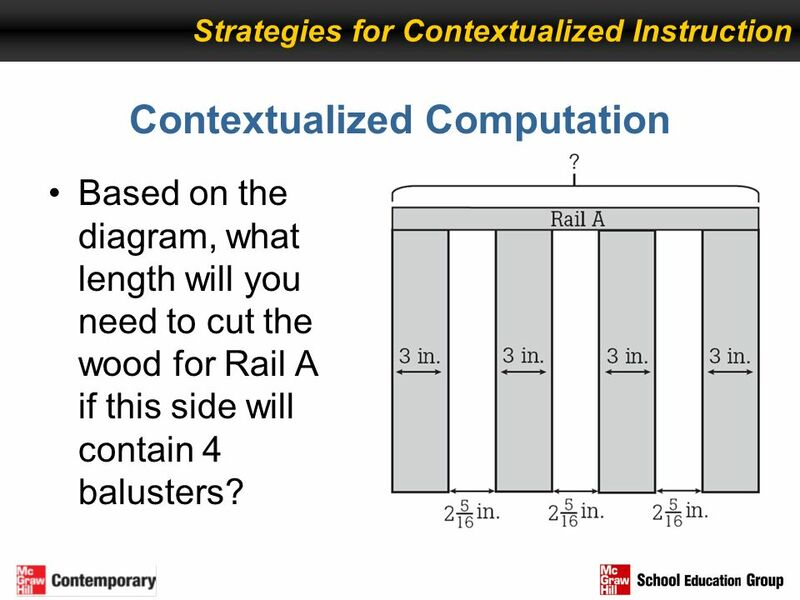 Strategies for Contextualized Instruction Contextualized Computation Based on the diagram, what length will you need to cut the wood for Rail A if this side will contain 4 balusters? 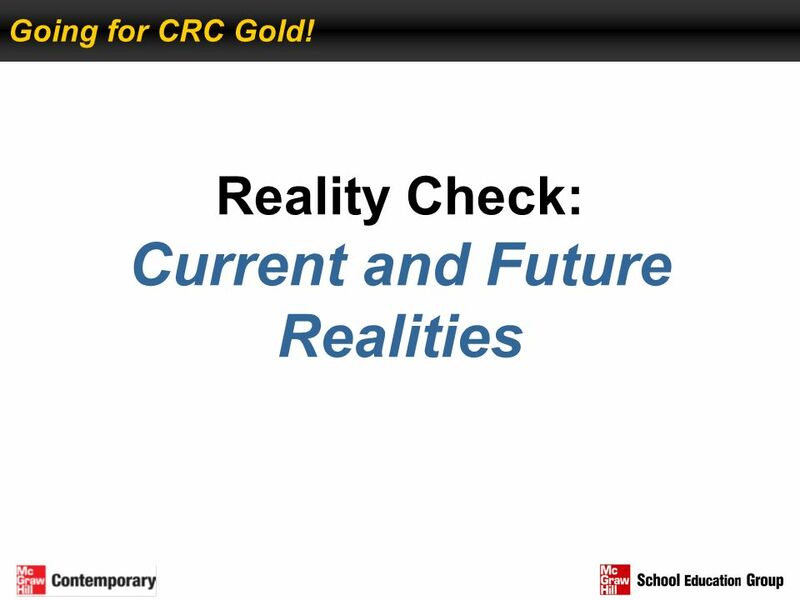 This problem involves carpentry, part of the Architecture and Construction career cluster. 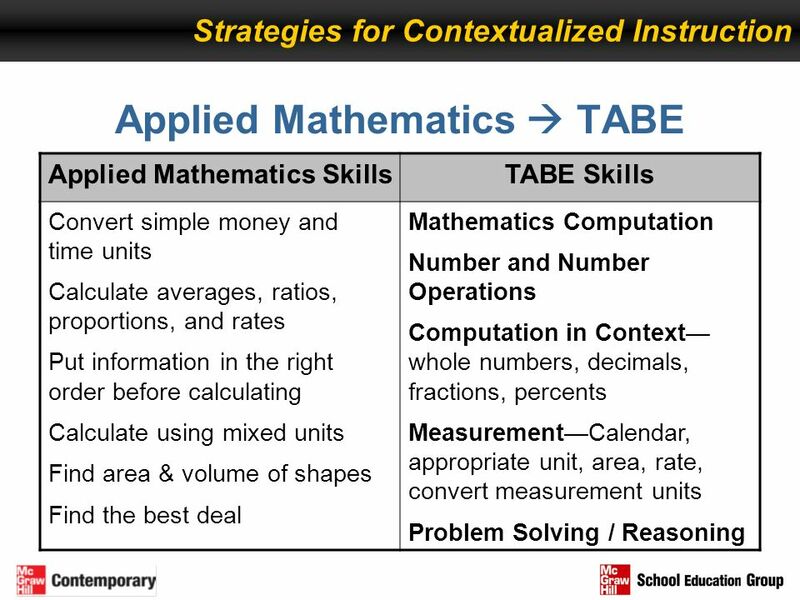 The skills being practiced are “solve problems with math operations” and “add up to three fractions that share a common denominator.” The TABE skill is addition of fractions and computation in context. 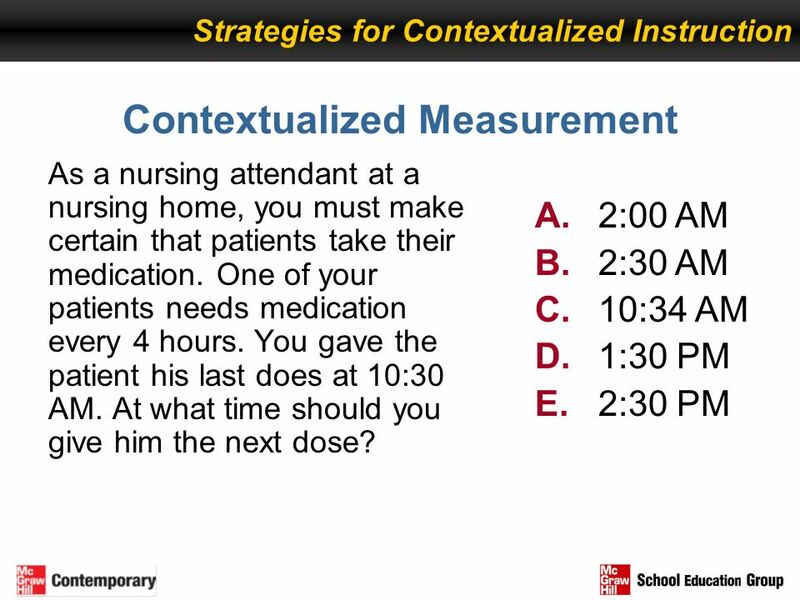 Strategies for Contextualized Instruction Contextualized Measurement As a nursing attendant at a nursing home, you must make certain that patients take their medication. One of your patients needs medication every 4 hours. You gave the patient his last does at 10:30 AM. At what time should you give him the next dose? 2:00 AM 2:30 AM 10:34 AM 1:30 PM 2:30 PM The skills being practiced are “solve problems with math operations” and “convert time.” The TABE skill is computation in context and measurement: time. 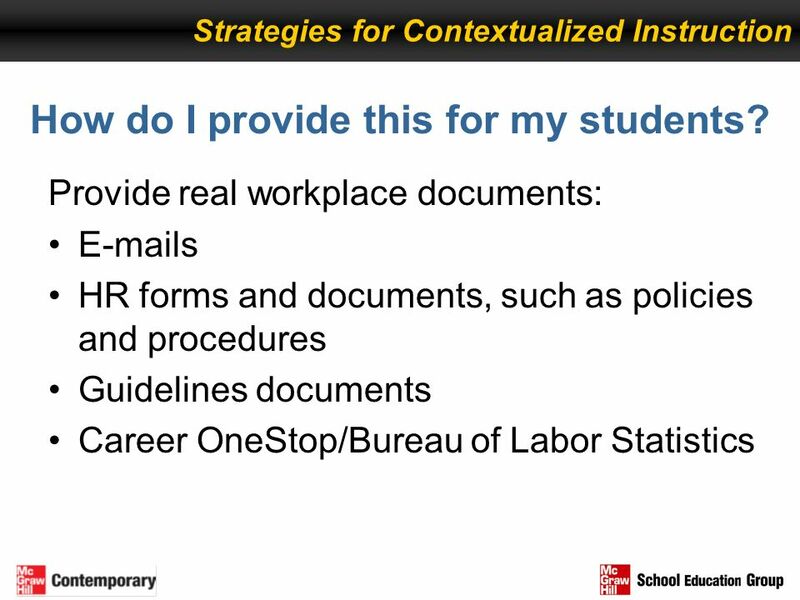 89 How do I provide this for my students? 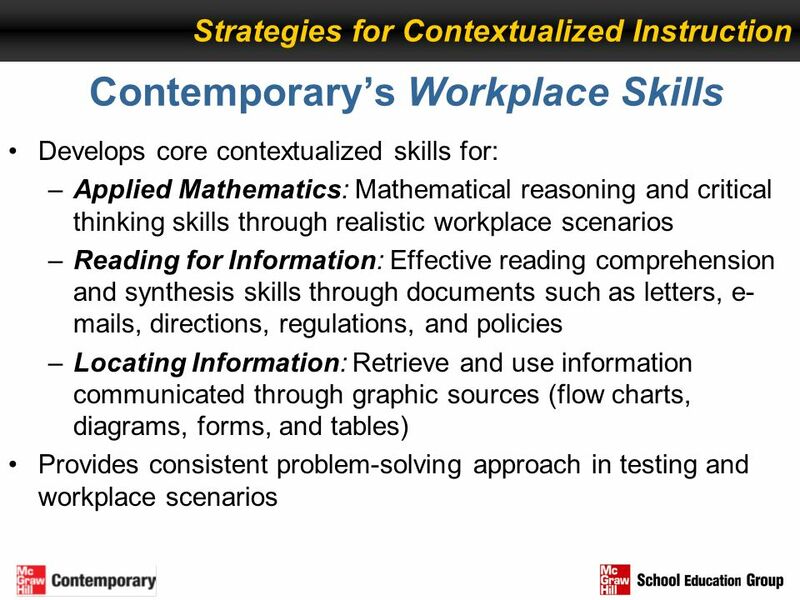 Strategies for Contextualized Instruction How do I provide this for my students? 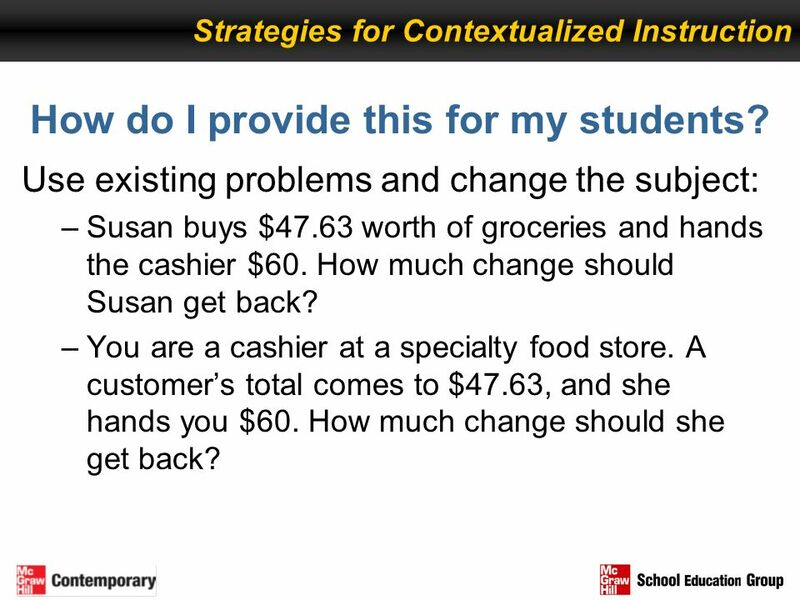 Use existing problems and change the subject: Susan buys $47.63 worth of groceries and hands the cashier $60. How much change should Susan get back? You are a cashier at a specialty food store. A customer’s total comes to $47.63, and she hands you $60. How much change should she get back? 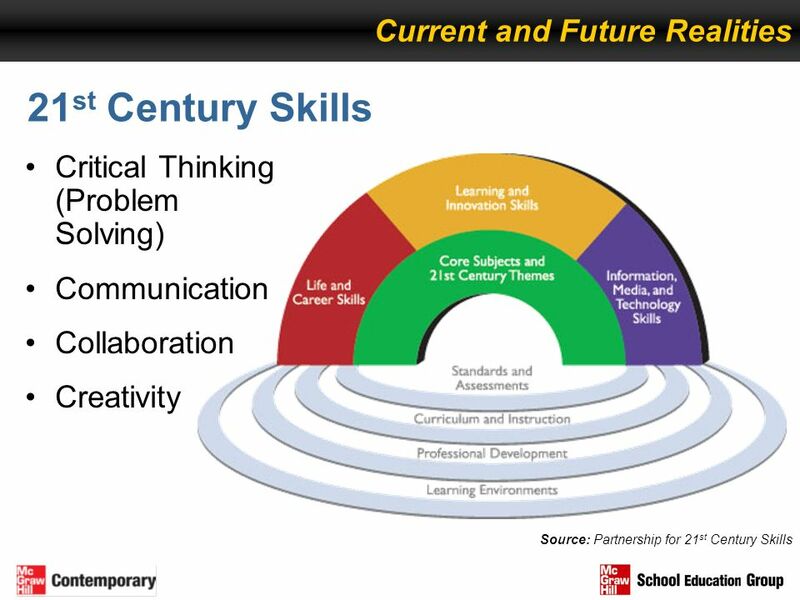 90 How do I provide this for my students? 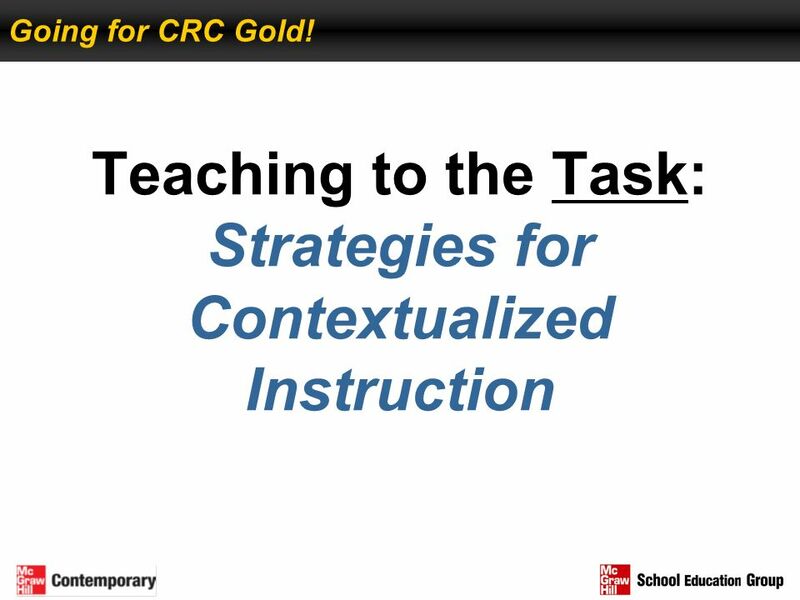 Strategies for Contextualized Instruction How do I provide this for my students? 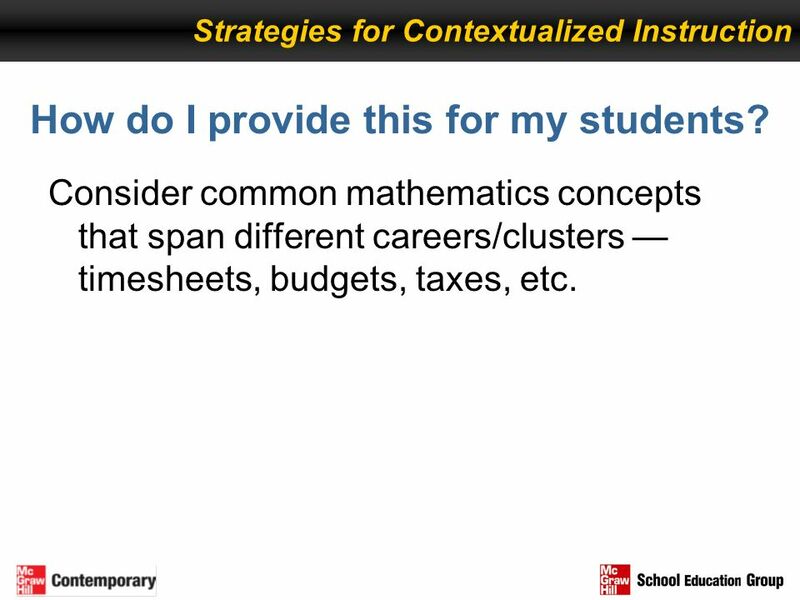 Consider common mathematics concepts that span different careers/clusters —timesheets, budgets, taxes, etc. PENNSYLVANIAS ADULT CAREER PATHWAYS National Career Pathways Network October 18, 2012. 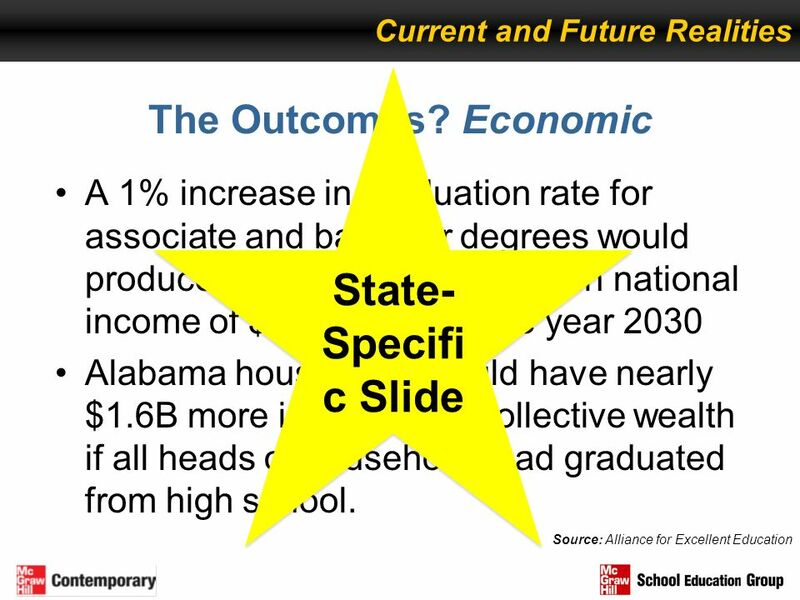 Council for Education Policy, Research and Improvement CEPRI Projects Presentation to State Board of Education February 17, 2004. 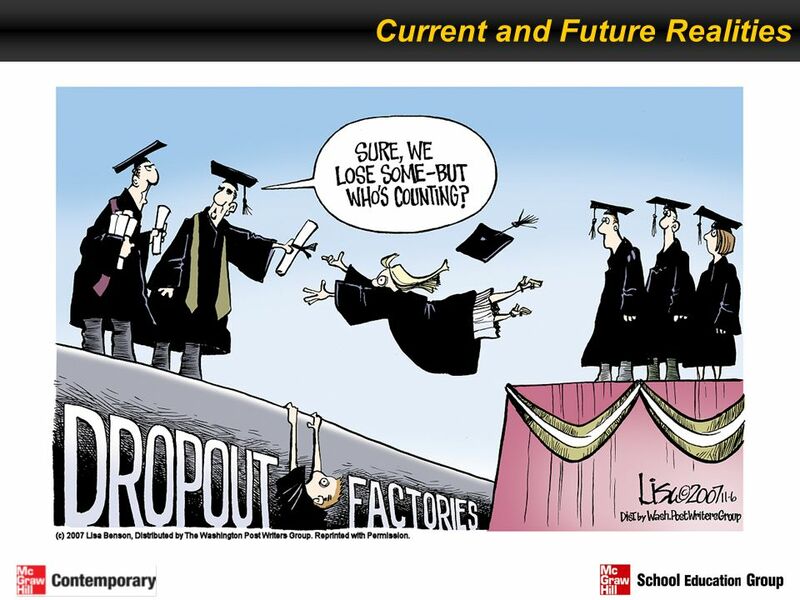 The Status of the Teaching Profession 2009 Copyright All rights reserved. 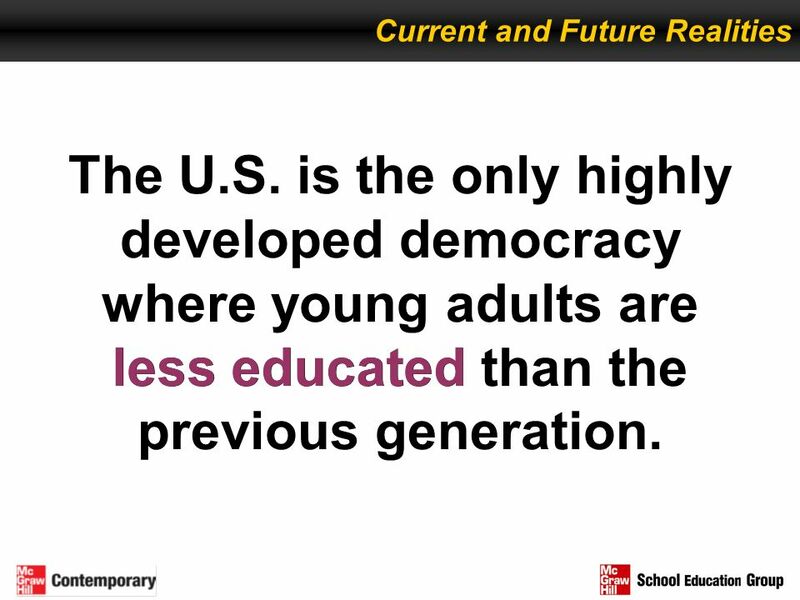 The Center for the Future of Teaching and Learning Research conducted by. Adult Education Directors Meeting March, 2012 Reno. 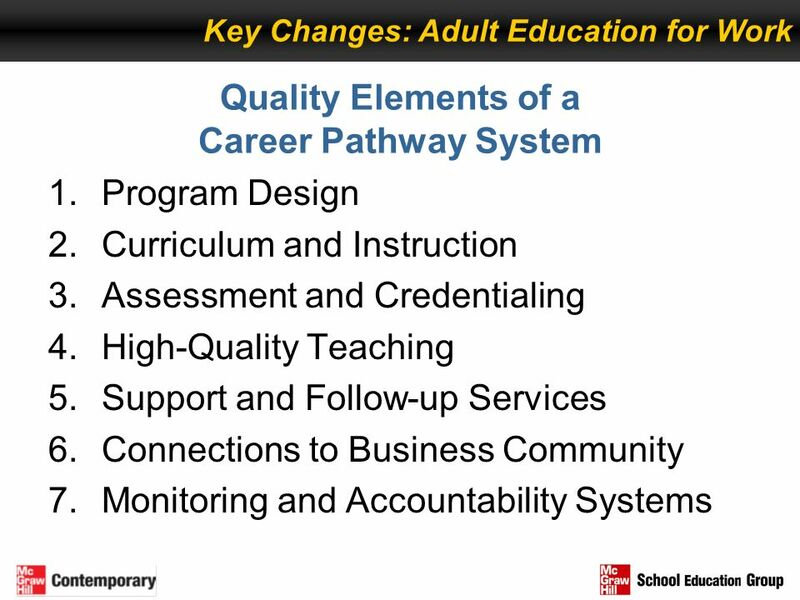 Washington's I-BEST Washington State Board for Community and Technical Colleges The Comprehensive I-BEST Pathway Models. 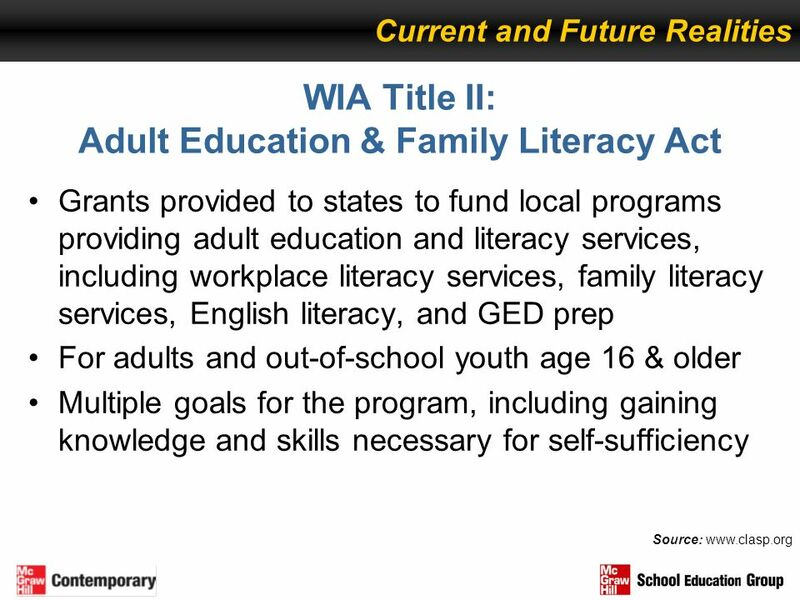 Washington's I-BEST Washington State Board for Community and Technical Colleges Expanding the Accelerated I-BEST Pathway. 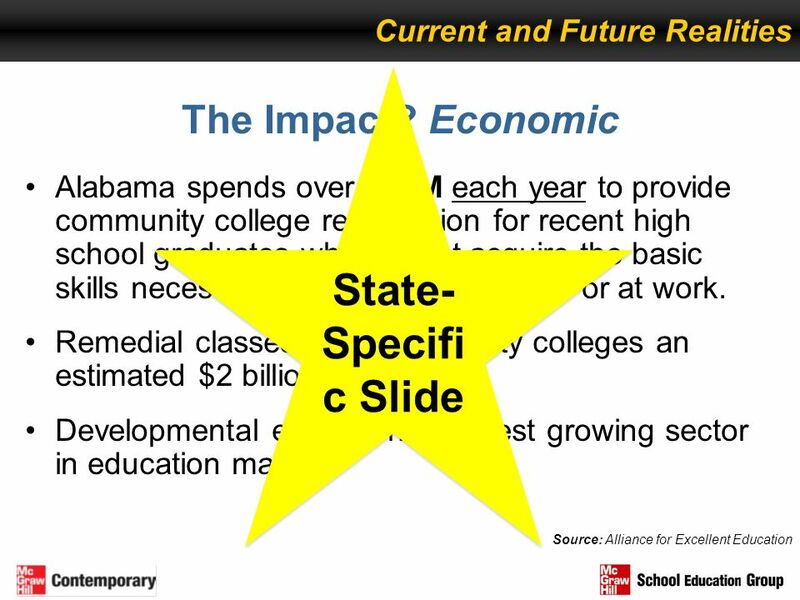 Essential Skills Task Force Defining the Essential Skills Presented to State Board October 18, 2007. 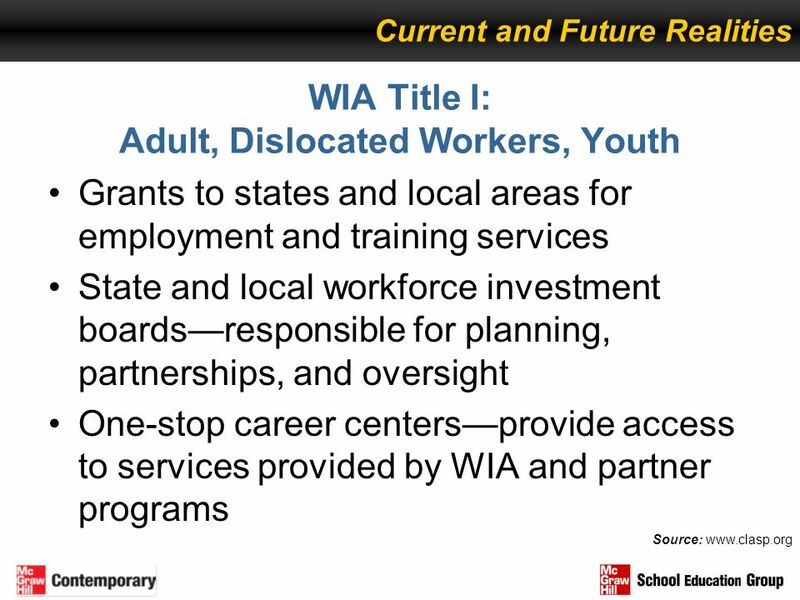 Career Advancement Strategies for Low Wage Workers Moving to a Demand Driven Workforce System Job Opportunities Task Force and Open Society institute. 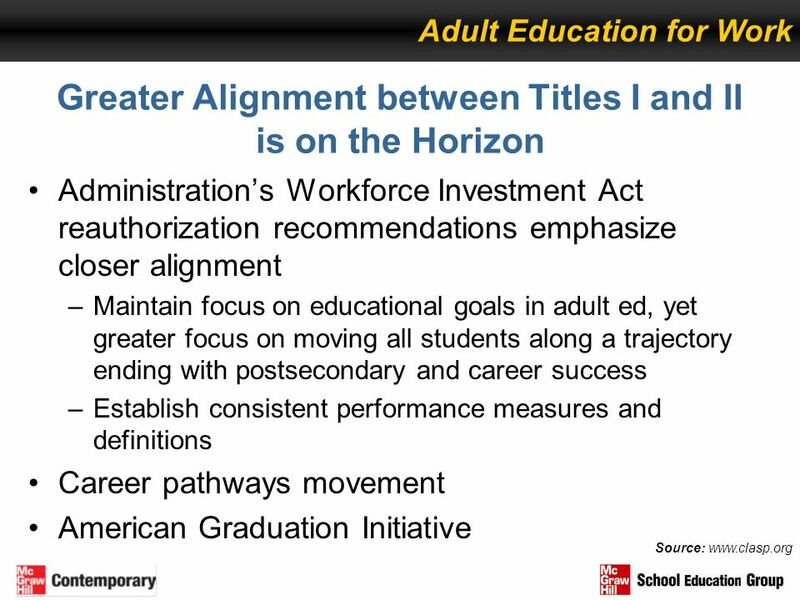 January,  Title I – Workforce Development Activities ◦ Subtitle A: System Alignment ◦ Subtitle B: Workforce Activities and Providers  Title. 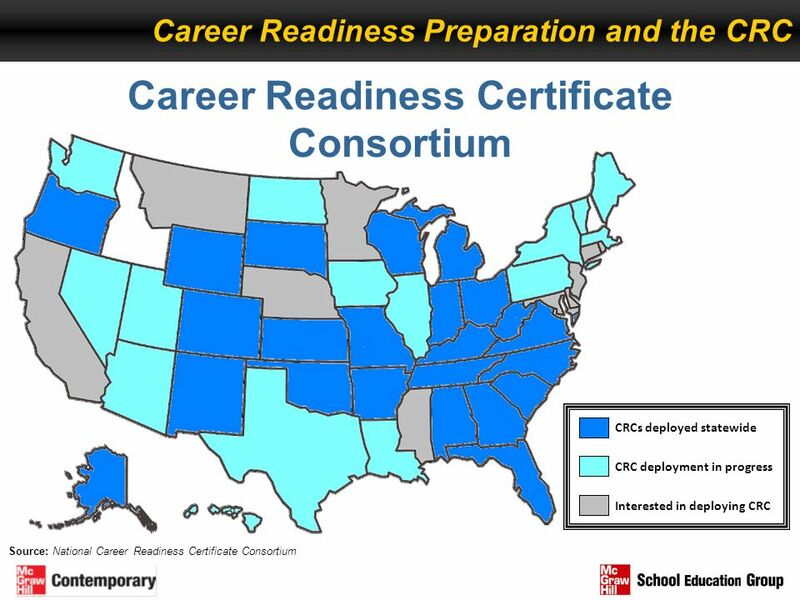 Coordinator Call November 20, Program Alignment Unified strategic planning across core programs Enhances role of State and Local Workforce Development. BETTER TOGETHER Region 6 DOL Gathering. 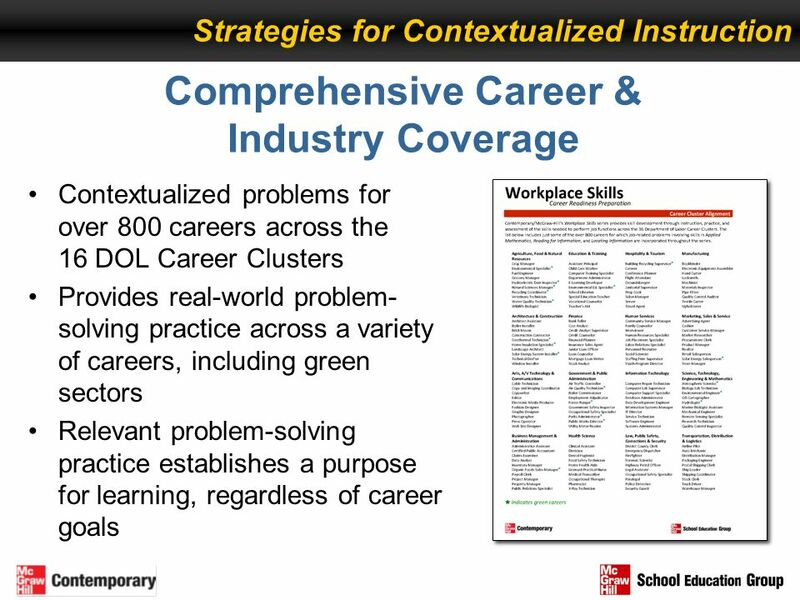 2 Organize Community Resources SIX GUIDING PRINCIPLES Deepen, Sustain Employer Partnerships Make Easier to Acquire. 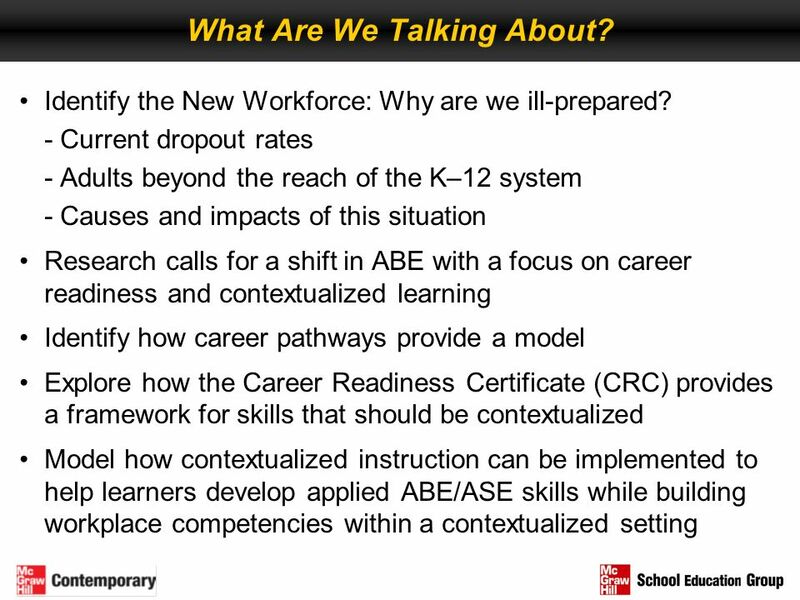 © 2013 Commonwealth Corporation 1 Closing the Massachusetts Skills Gap: Recommendations and Action Steps April 24, 2013. 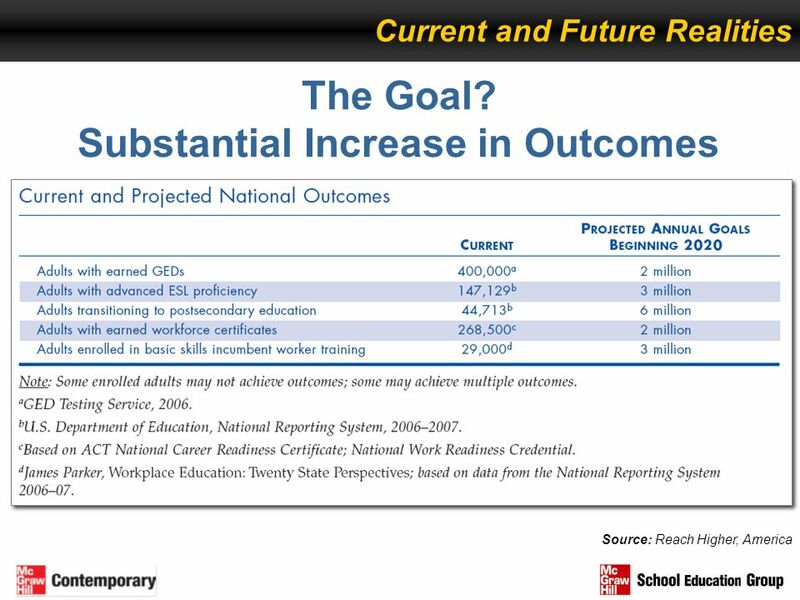 Challenge to Lead Southern Regional Education Board Kentucky Challenge to Lead Goals for Education Kentucky is On the Move Progress Report 2008 Challenge.